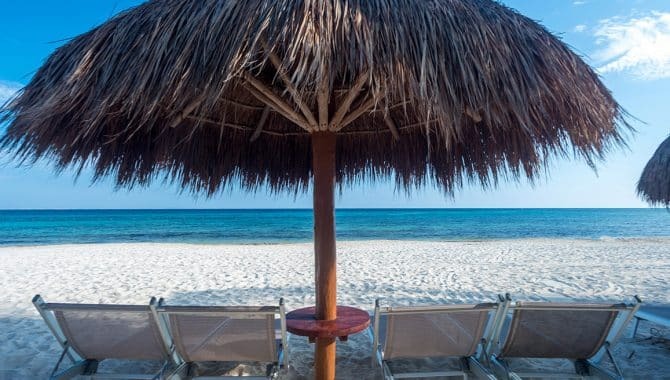 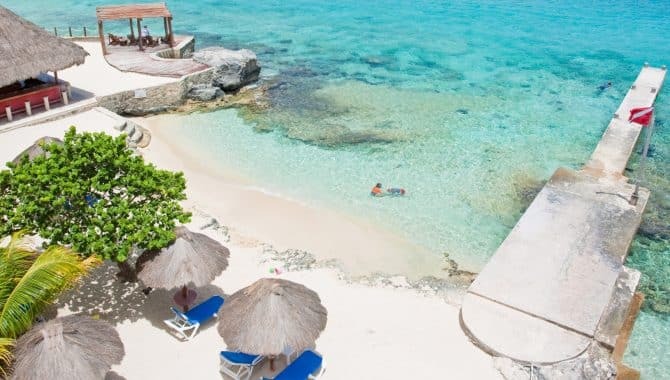 There are few beach destinations more perfect for a family than Cozumel, Mexico. 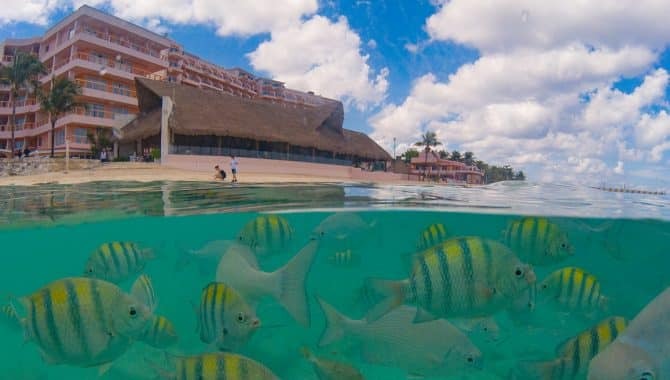 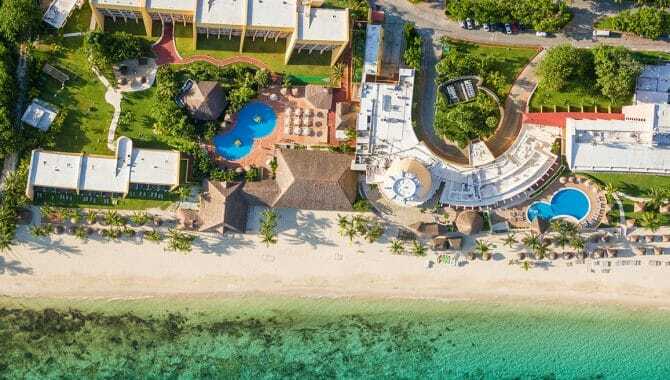 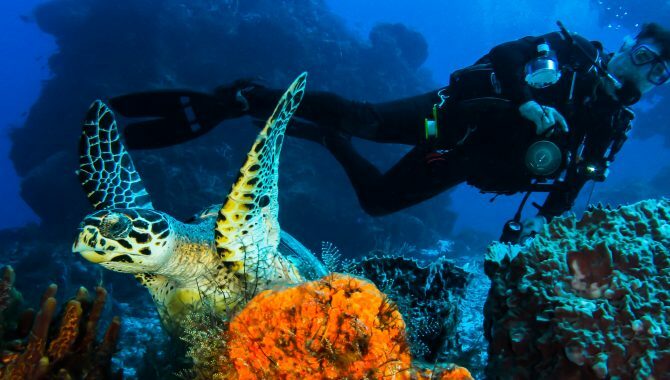 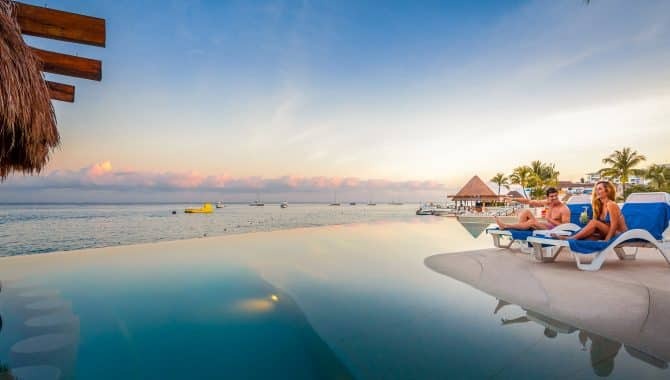 This famous vacation island has world-class snorkeling, peaceful beaches, authentic food and proximity to Mexico’s bustling towns of Cancún and Playa del Carmen. 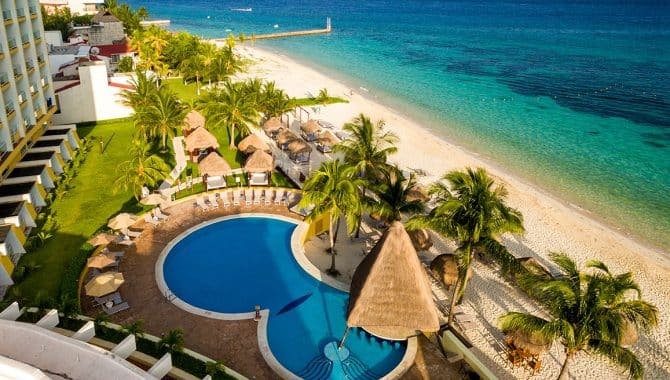 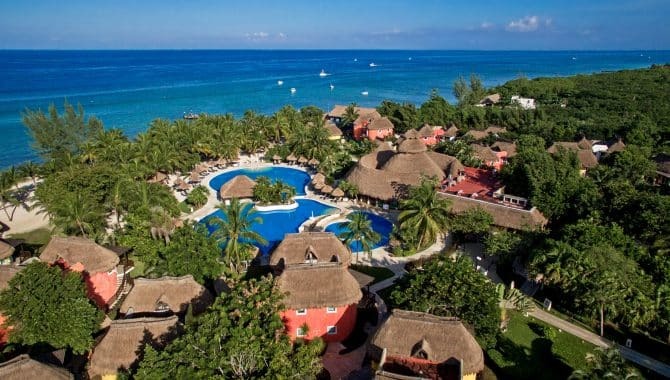 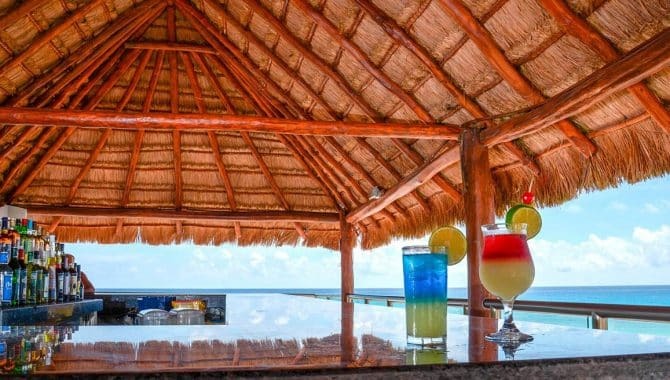 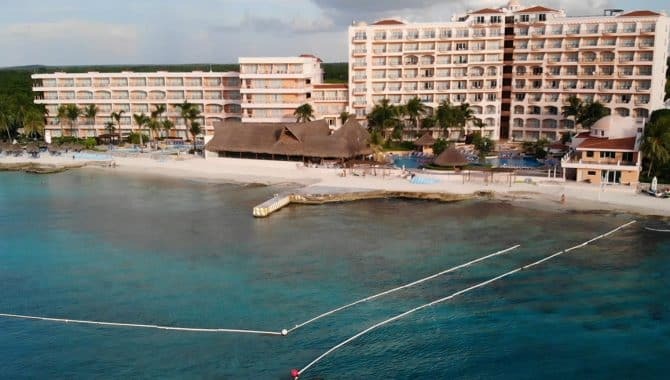 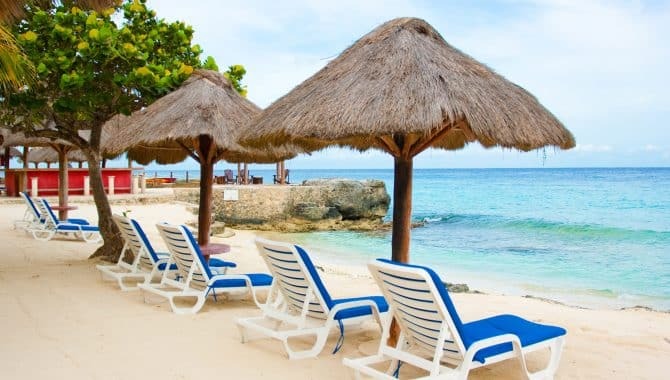 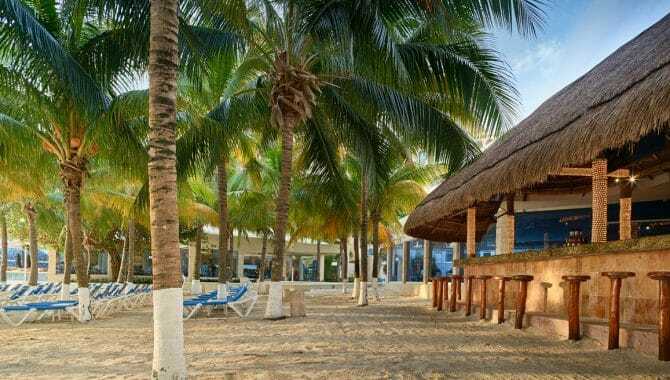 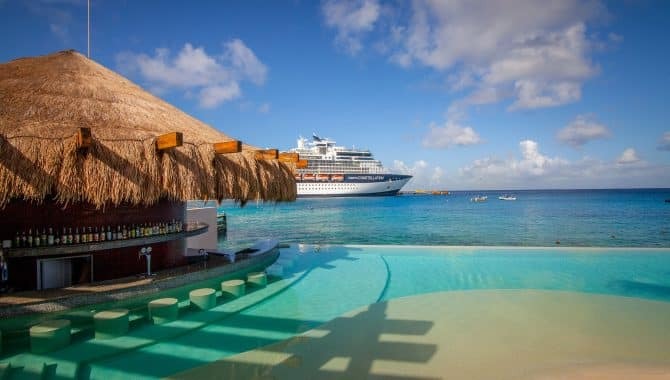 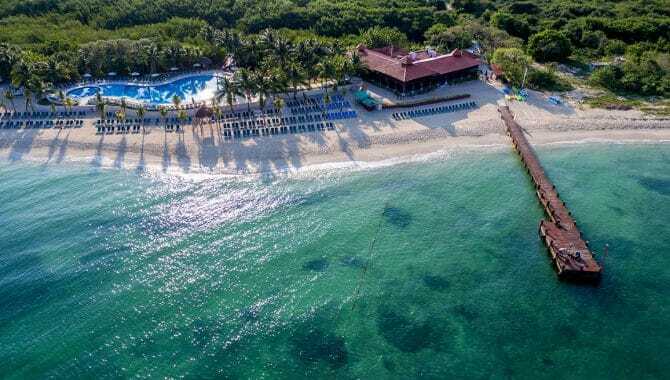 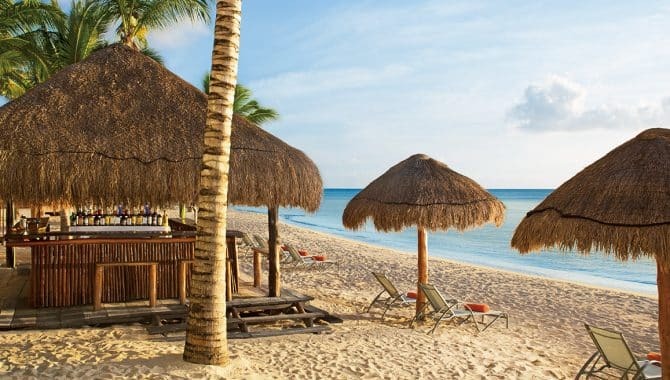 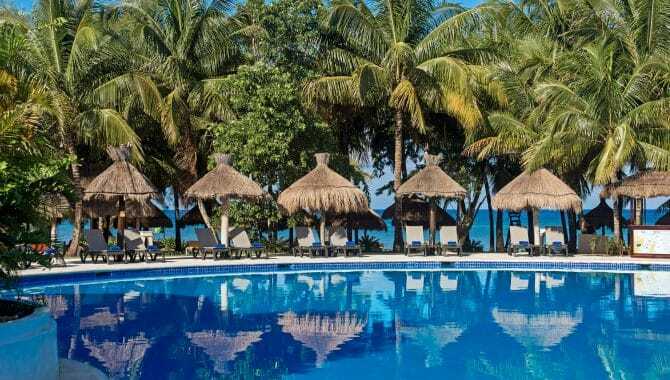 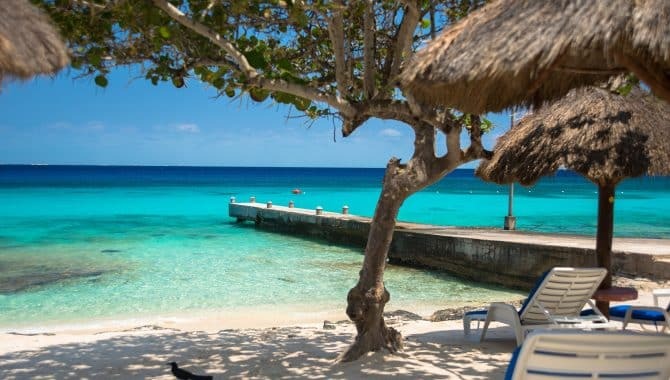 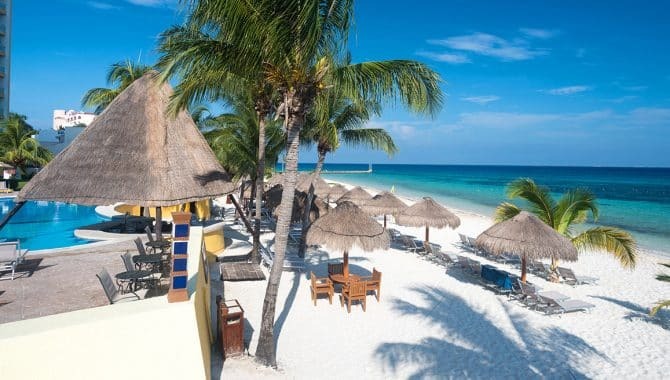 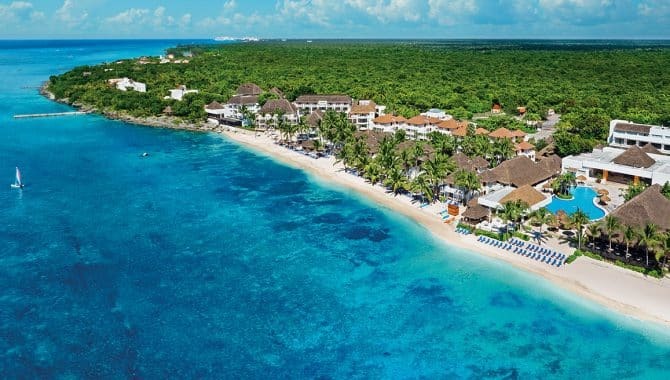 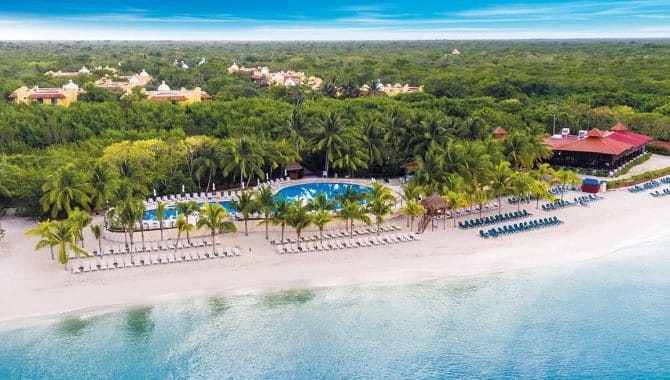 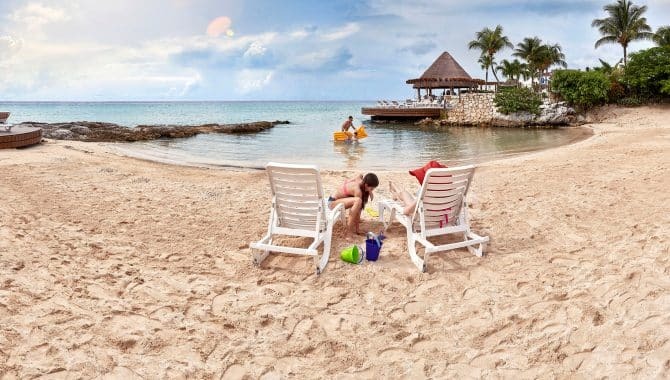 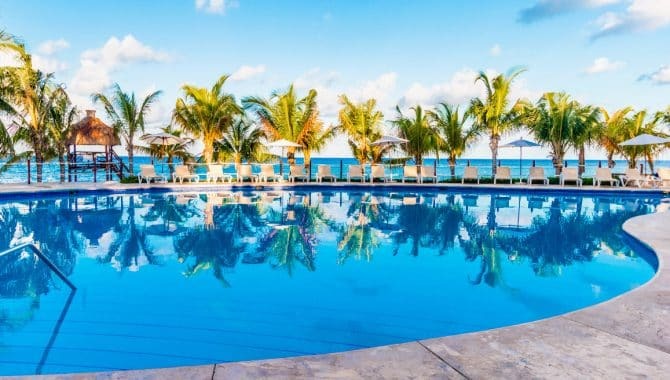 While many only know of Cozumel in the context of a cruise stop, this idyllic beach destination has family-friendly hotels for every taste and budget. 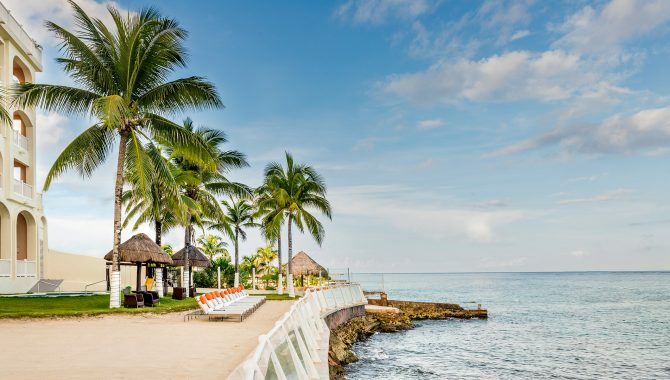 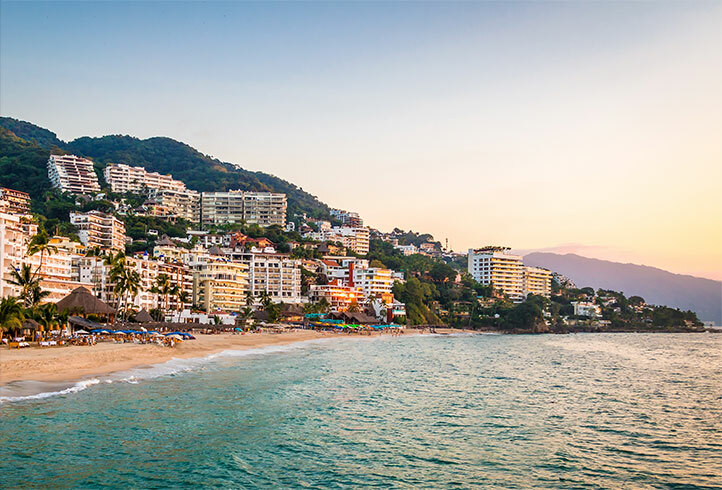 Explore Mexico’s most-talked-about Caribbean gem for more than an afternoon, book your full beach vacation in one of its amenity-packed beach resorts. 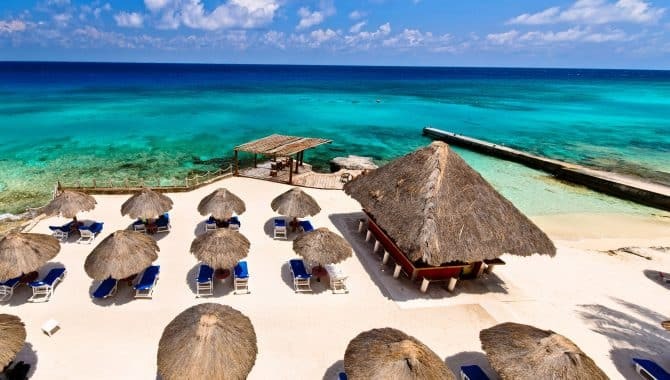 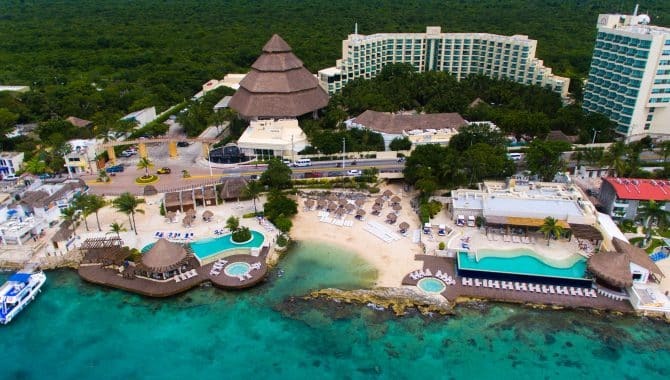 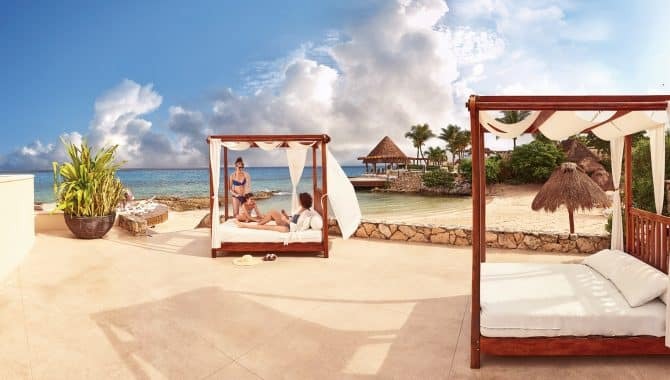 Cozumel Palace has everything you could want in an all-inclusive and more. 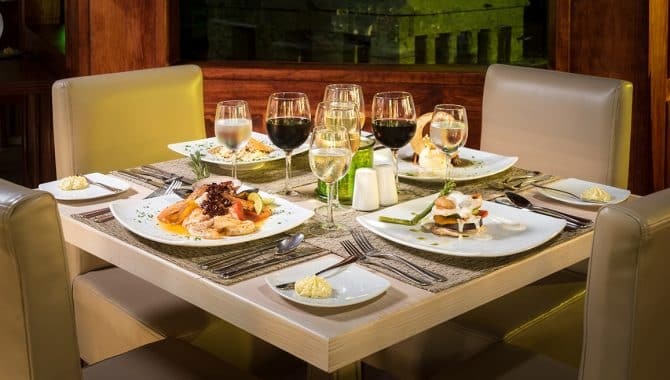 Dine indoor or outdoor at four restaurants with varied cuisines and enjoy unlimited top-shelf liquor and international wines included. 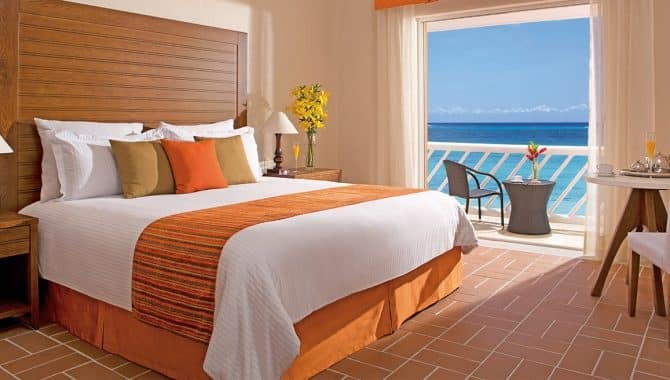 The spacious 196 suites have Caribbean views, double whirlpool tubs, purified water and 24-hour room service. 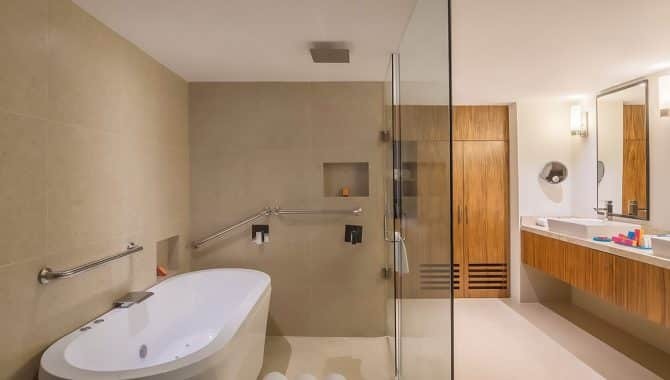 Concierge Level suites have even more special touches, like CHI hair care products, private check-in and out, and a personal balcony with a hammock. 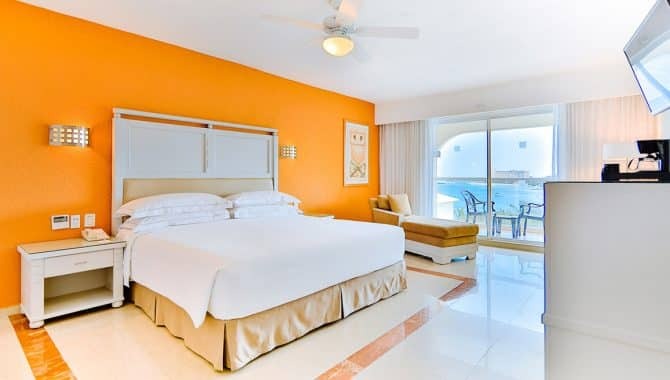 Your vacation will be varied and well-spent when you stay at Cozumel Palace. 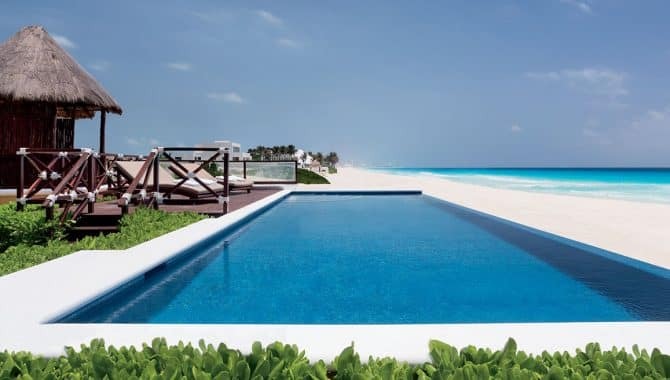 The Palancar Reef awaits inquisitive swimmers just off the resort’s dock and the Flamingos swim-up pool bar stands at the ready to refresh your senses with a cocktail. 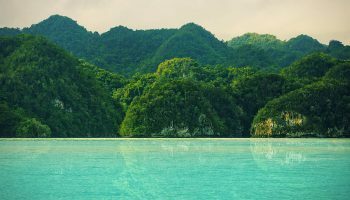 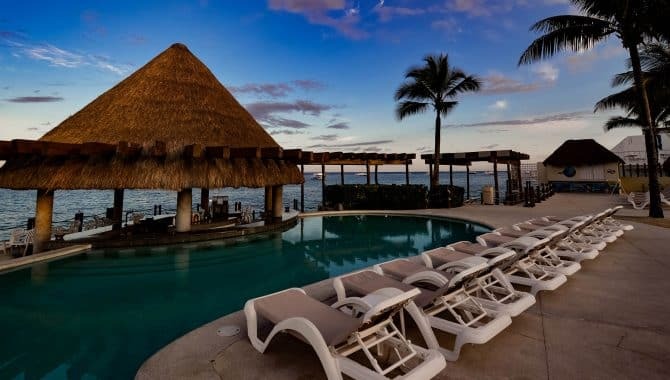 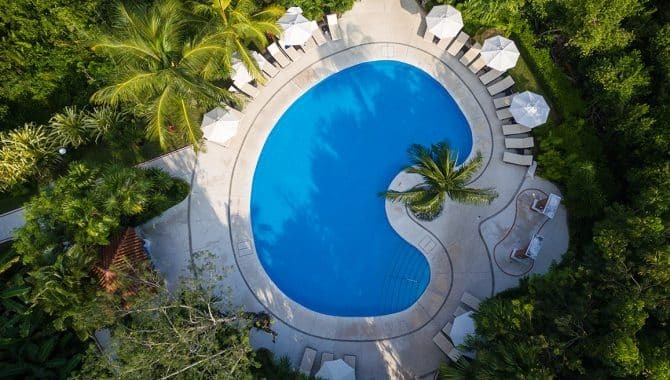 Included snorkel gear, pool volleyball and entertainment, like break dance and fire shows with professional dancers, give you an all-out vacation with minimal effort. 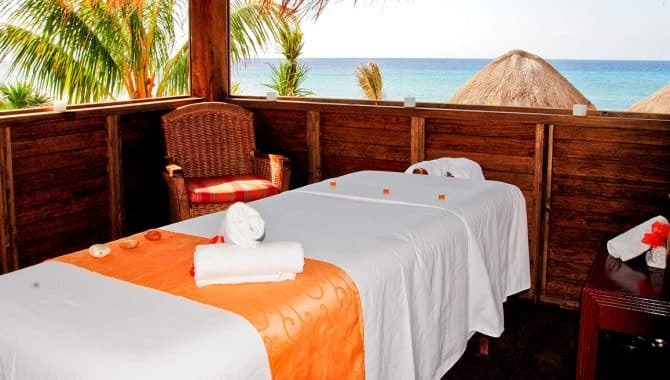 You receive resort credit based on the length of your stay that you can use on activities that aren’t included like golf, dives at Aqua Safari and spa treatments. 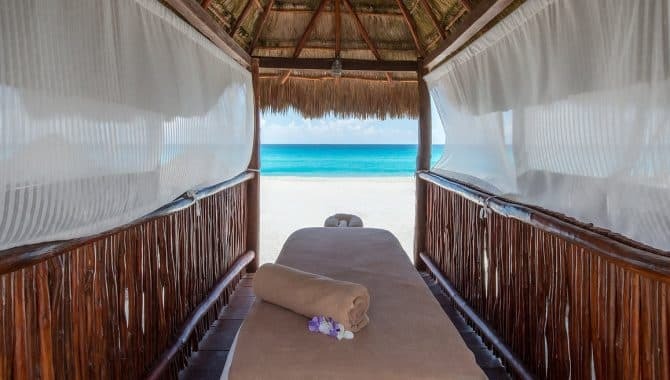 When you just want to close your eyes and let your thoughts float, the Awe Spa delivers with aromatherapeutic massages, facials and even a Fish Spa Experience with the Garra Rufa fish. 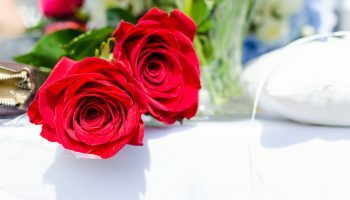 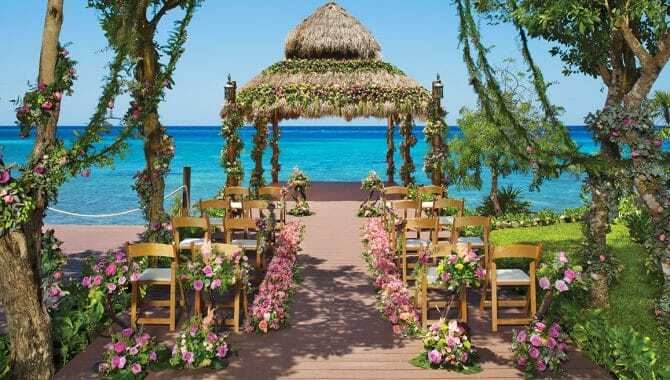 Brides to be—plan away! 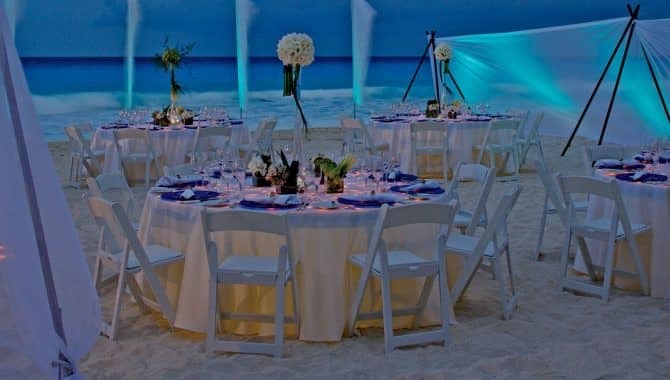 This resort has seven themes to choose from, custom weddings and even a traditional Indian wedding option. 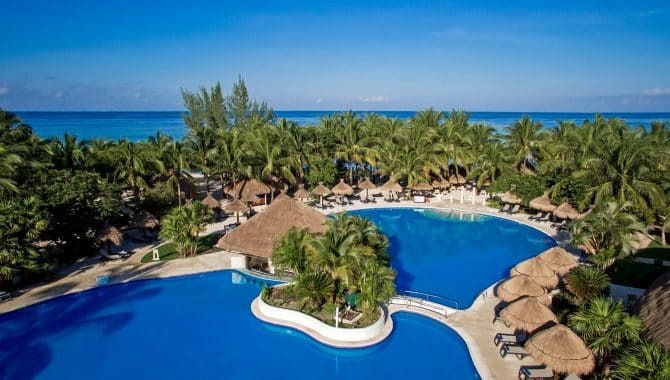 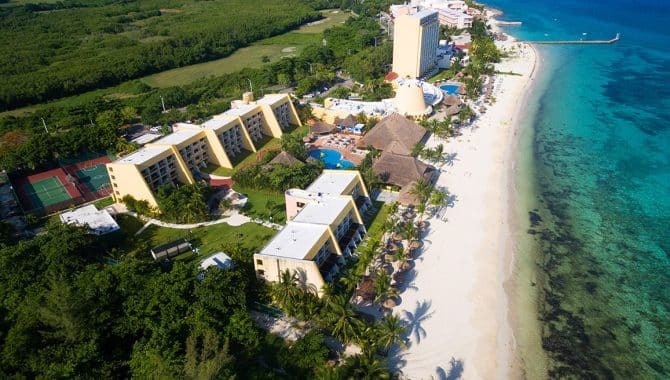 Grand Park Royal Cozumel resort is designed to meet the needs of kids and adults alike. 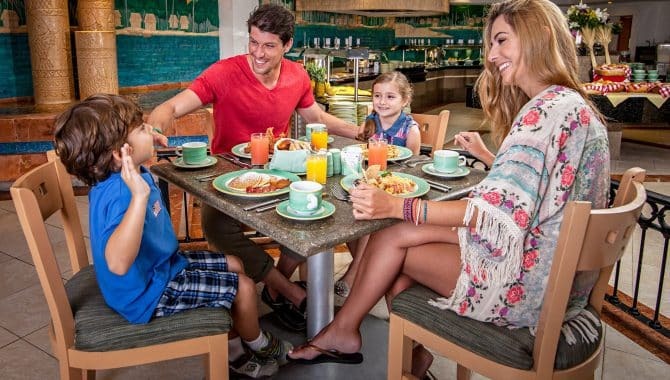 Start your mornings with coffee, tea and pastries at Café Solé before heading to the adults-only pool for relaxation or to the kids’ pool for family fun. 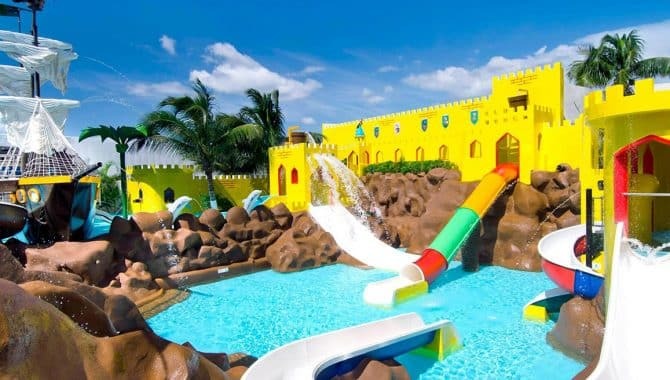 The Kids’ Club offers a huge variety of activities, including water slides, a mini theater and playground. 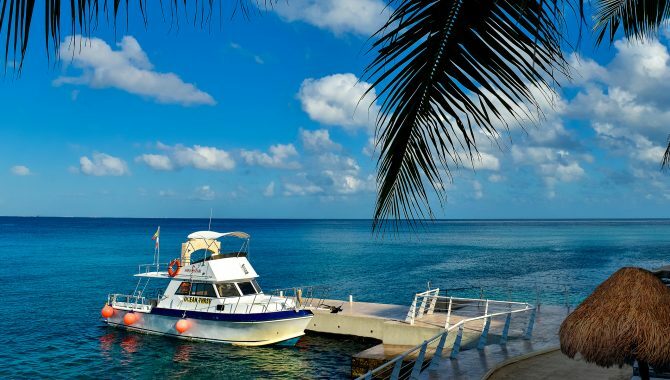 For teens and adults, grab equipment from the hotel and go on a snorkeling adventure right off the private dock. 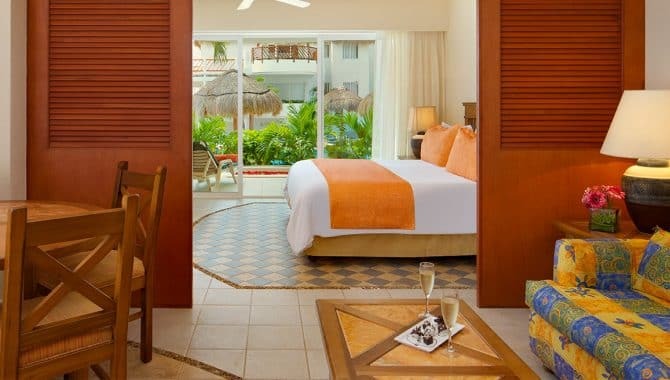 Or take a more laid-back approach to vacation, lounge on a deck chair or beachside cabana. 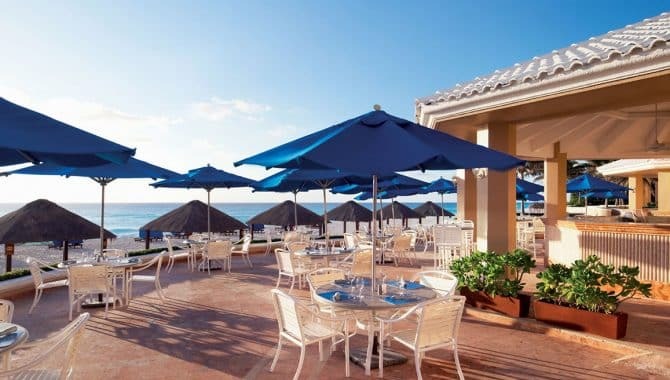 When it’s time to recharge, grab a bite to eat at the hotel’s buffet or three restaurant options. 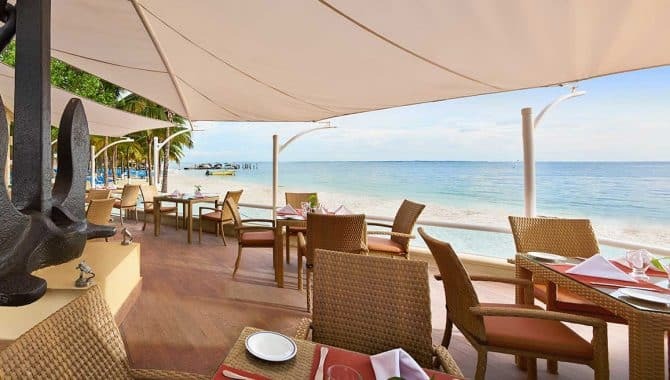 La Veranda Restaurant overlooks the majestic garden area and offers buffet morning, noon and night, featuring a variety of international food options. 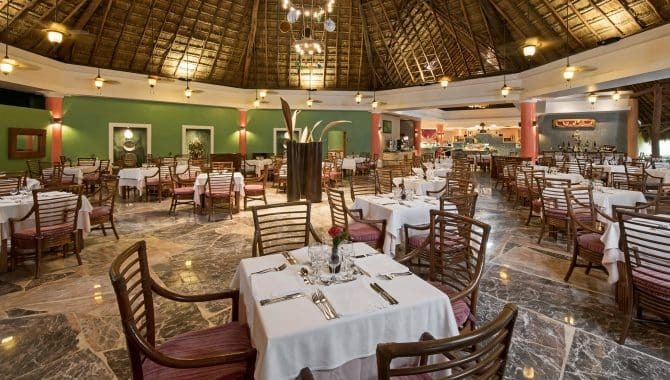 For authentic Mexican cuisine, El Mexicano is a top choice while El Italiano is sure to satisfy your Italian cuisine cravings. 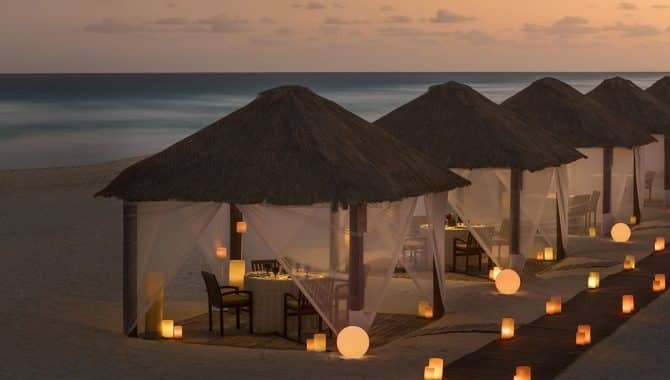 For a date night, choose the adults-only El Caribeño for exotic Caribbean flavors and specialties. 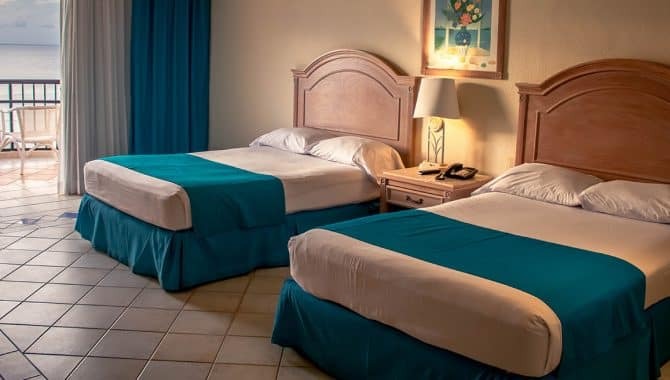 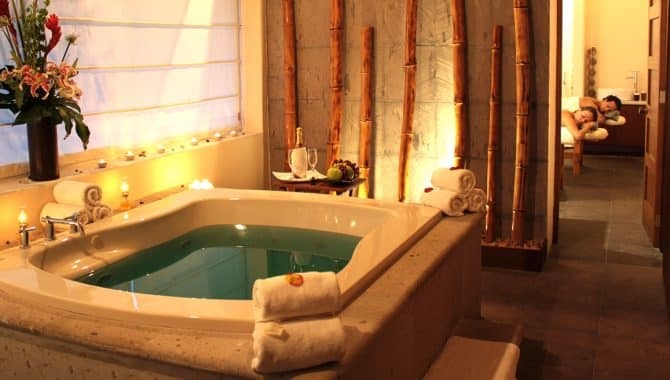 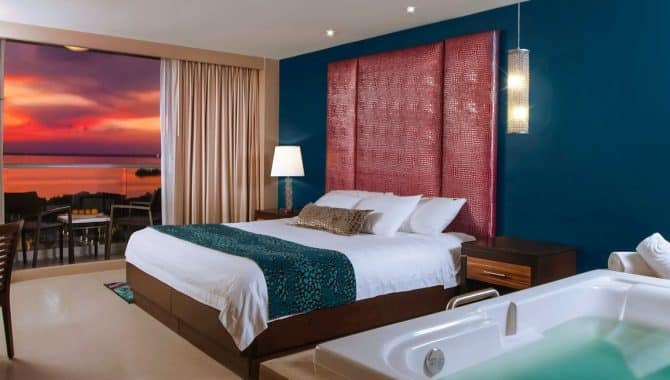 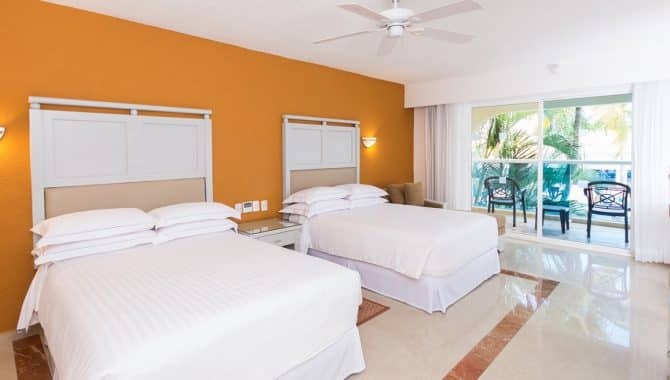 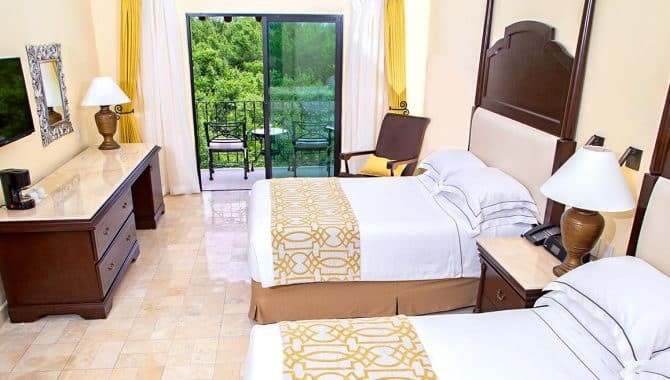 All of the Cozumel resort’s 342 rooms are designed with comfort in mind. 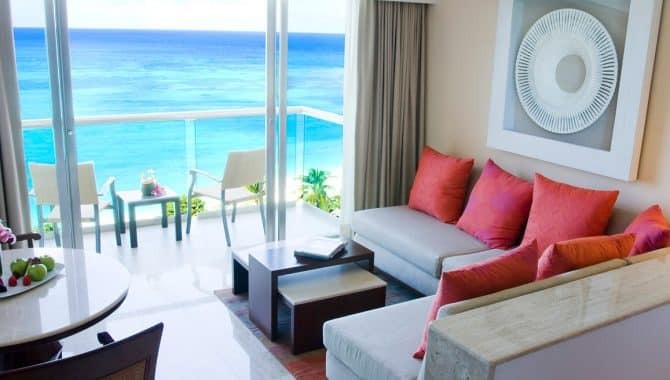 The arrangements offer cozy decor, furnished balconies and flat-screen TVs. 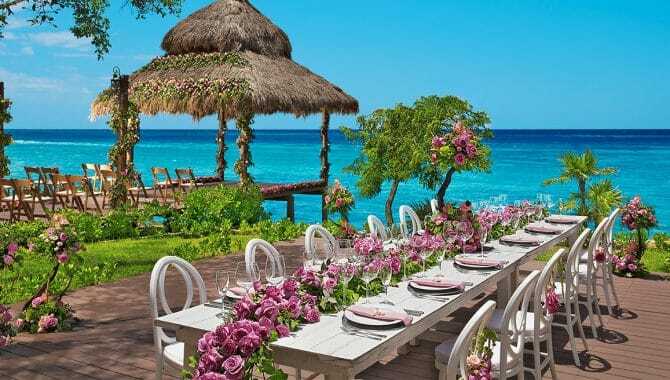 Guests also have the option of garden or ocean views. 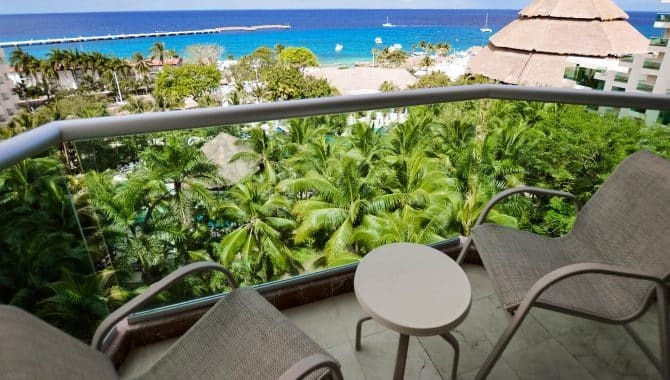 Create memories of a lifetime for the whole family at Sunscape Sabor Cozumel. 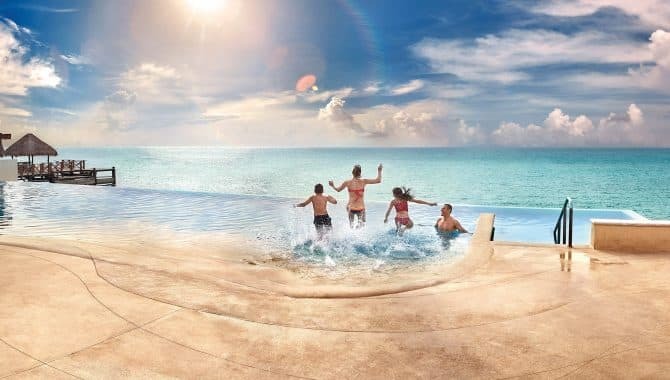 The resort’s “Unlimited Fun” package will make your kids feel like real VIPs with a special check-in experience and red carpet stairs as well as welcome treats and resort passports included. 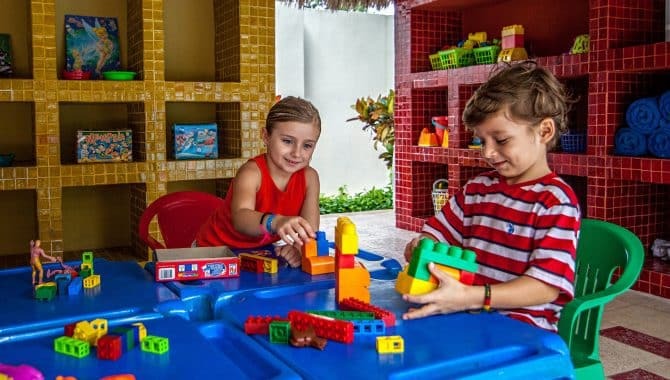 Supervised activities are available daily for kids ages 3 to 12 at the Explorer’s Club, and the Core Zone Teens Club is on site for older kids. 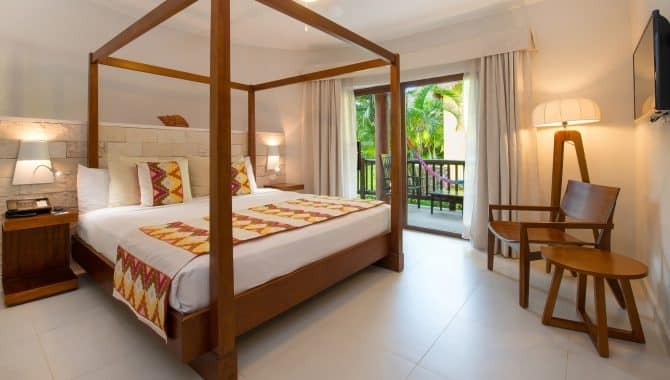 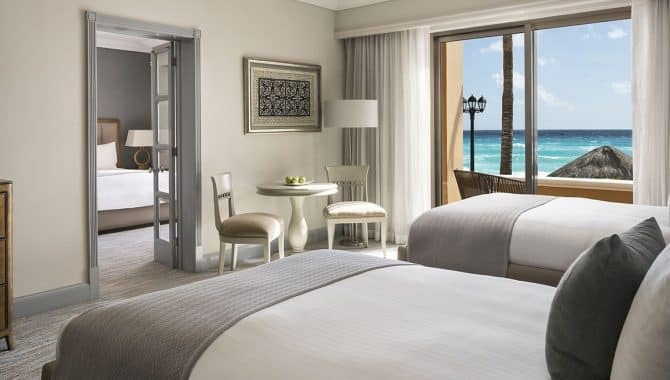 Choose from one of the open, breezy rooms that overlook the garden, the pools or the sparkling Caribbean. 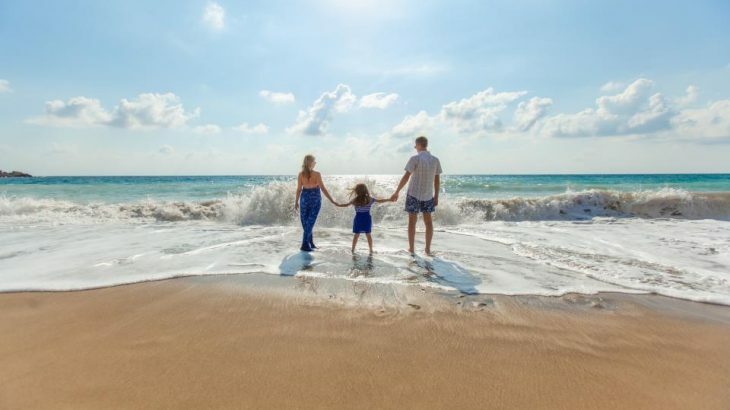 Families can travel with ease thanks to the connecting-suite option. 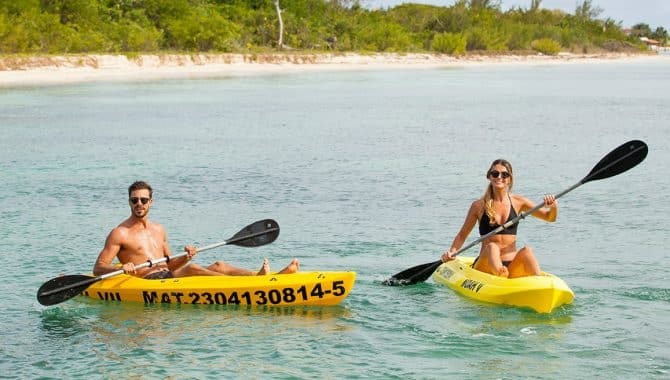 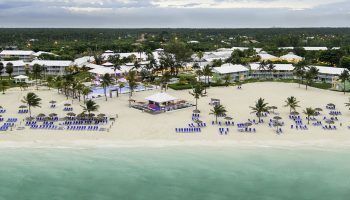 There is plenty to do for adults as well: bars and lounges serve international and domestic spirits, live music and entertainment are offered daily, and the spectacular beach comes with a host of water activities. 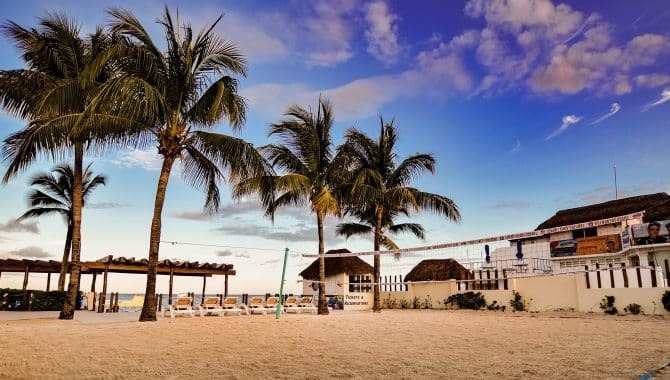 Those who would rather stay on land can take advantage of ping pong, yoga and beach volleyball. 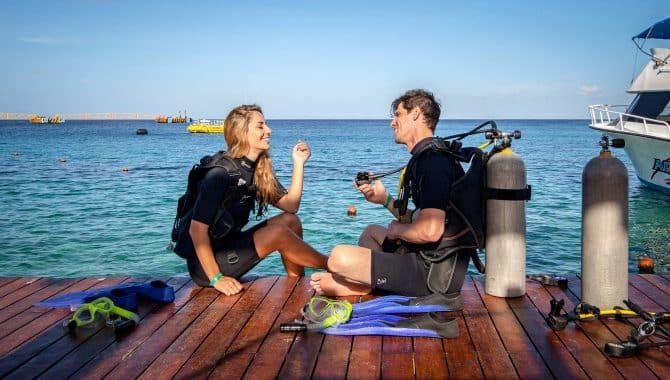 For an extra fee, snorkeling and scuba diving are available as well. 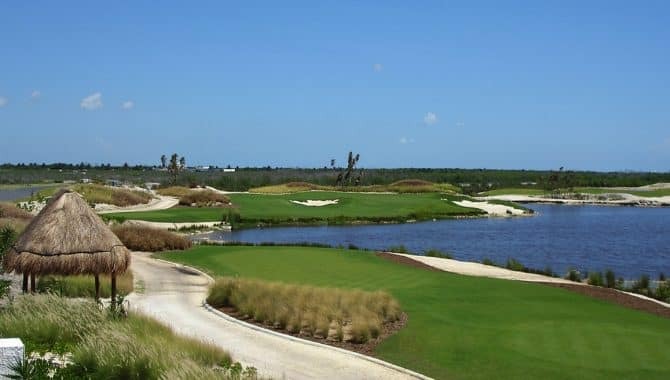 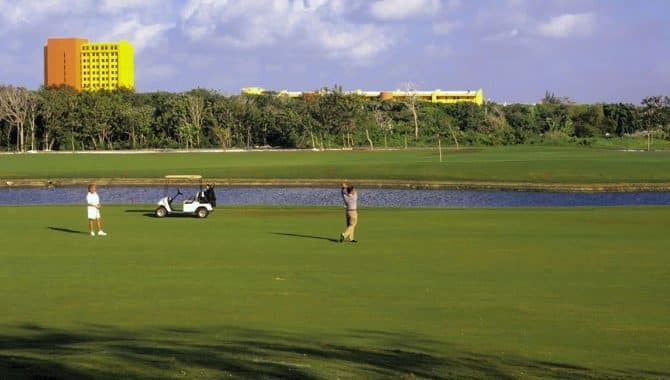 Cozumel Country Club, featuring a par-72 golf course designed by Steve Nicklaus–son of the Golden Bear himself–is just 30 minutes away. 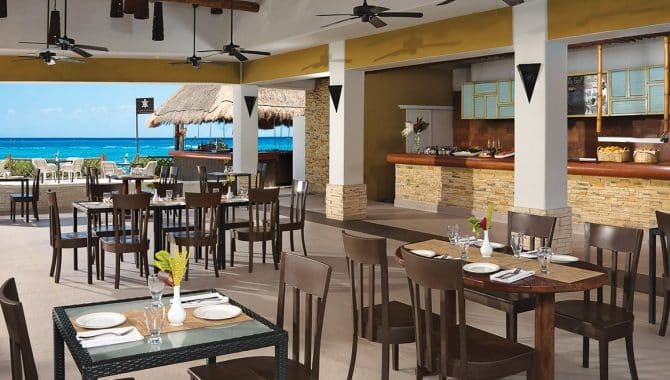 Every taste and mood can be satisfied at one of the four on-site restaurants. 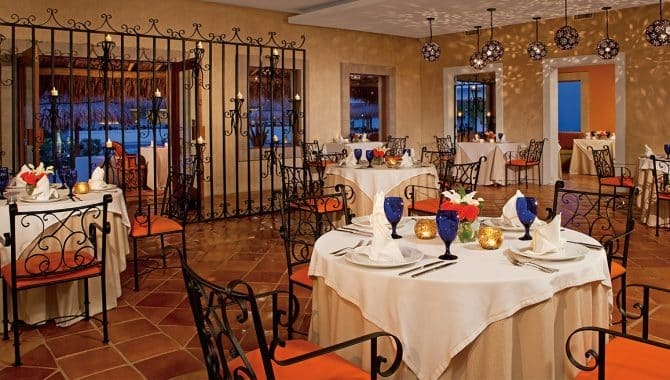 Choose from Mexican, Italian and international cuisine. 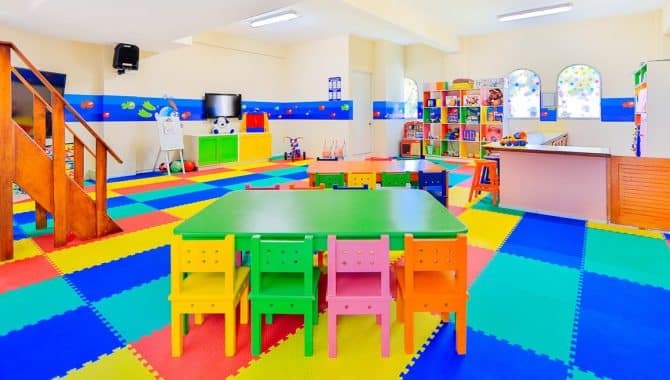 Special kid’s menus are available as well. 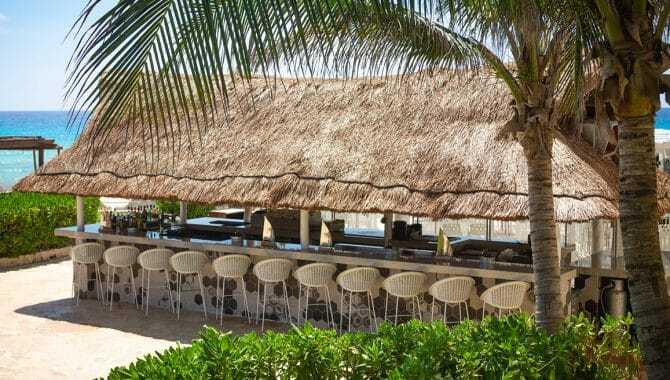 Some areas have food and snacks available 24 hours a day, and reservations are never needed at the restaurants. 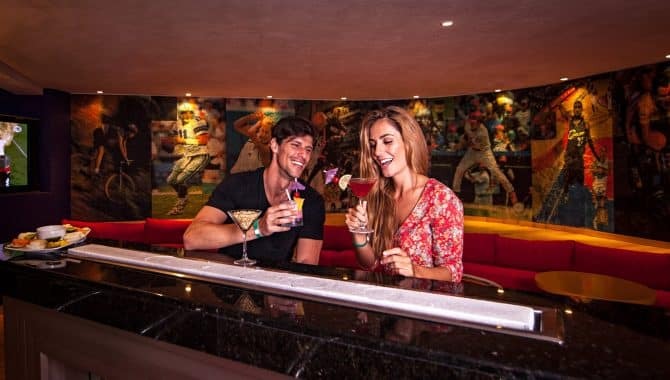 Three bars and lounges serve unlimited drinks, including spirits, soft drinks and natural fruit juices. 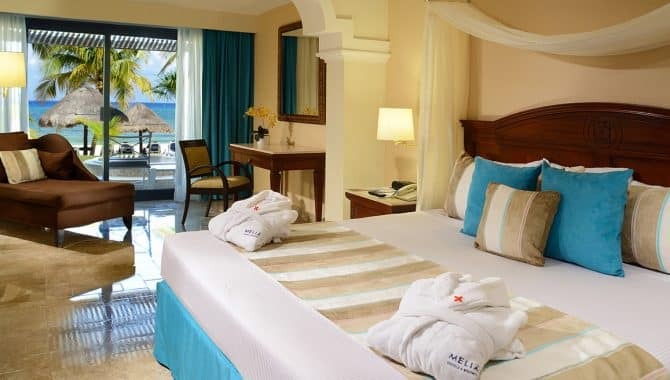 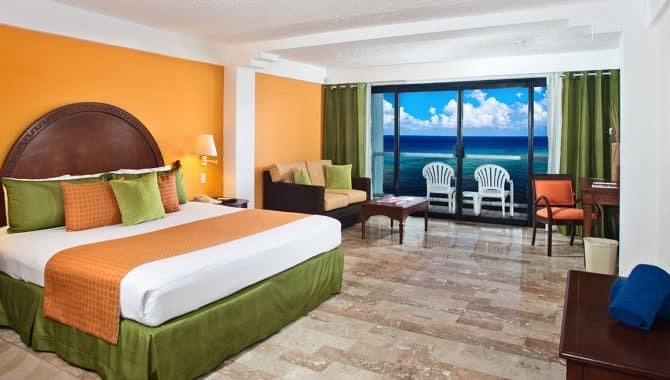 As a family-owned hotel, Playa Azul offers a comfortable, cozy atmosphere ideal for relaxation. 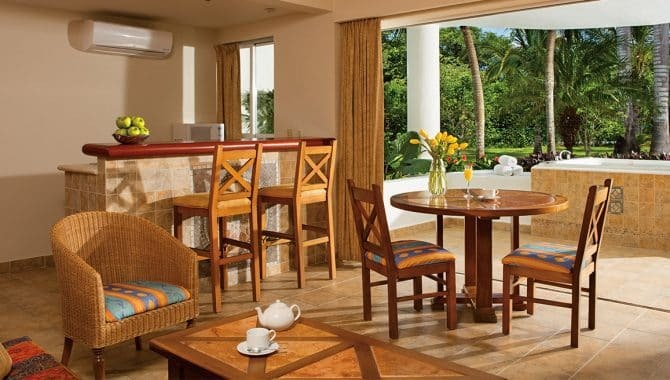 Wake up to a hot breakfast at the buffet before renting a bike from the hotel for a trek around the island. 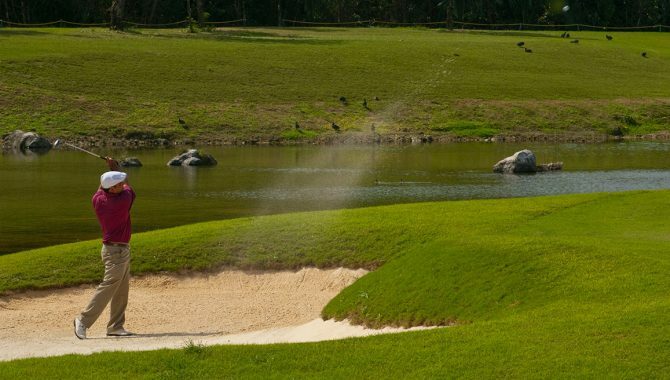 Spend the rest of the day on the green, playing a relaxing game of golf next to the picturesque shoreline. 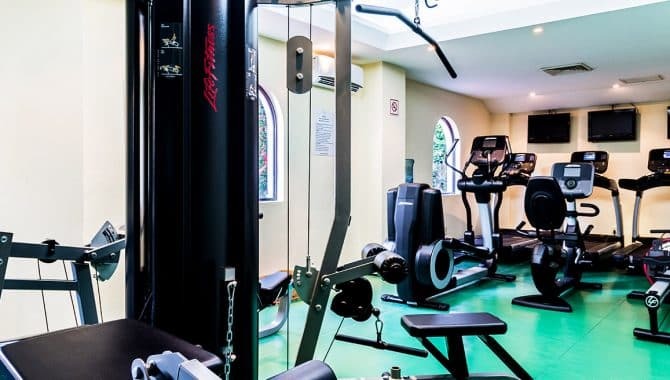 Tight muscles? 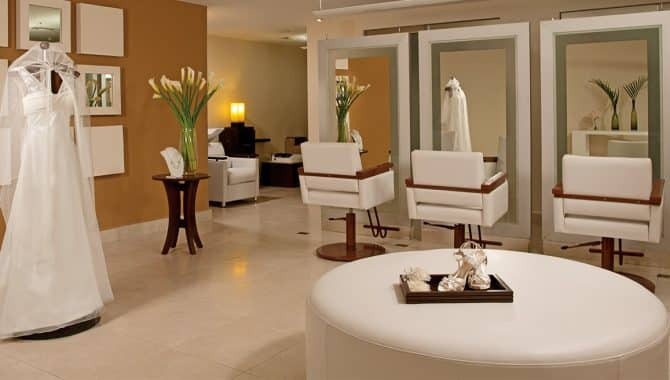 Treat yourself at Spa Savia with a holistic relaxation massage or hot stones therapy. 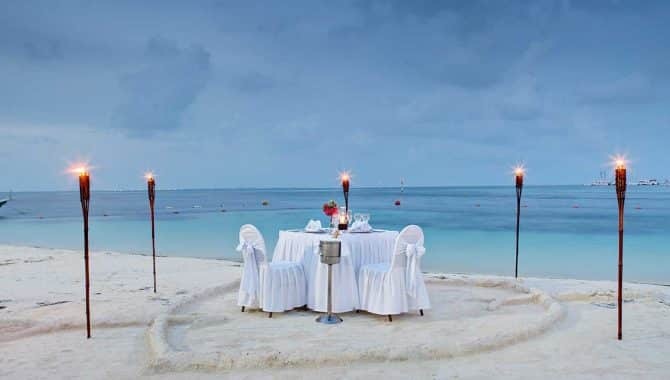 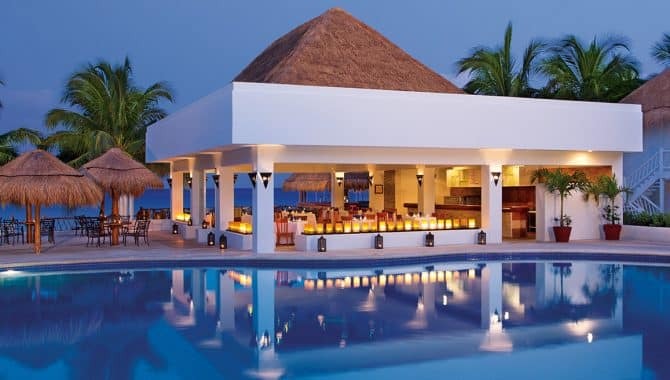 After a day of leisure, grab dinner at one of the resort’s two restaurants. 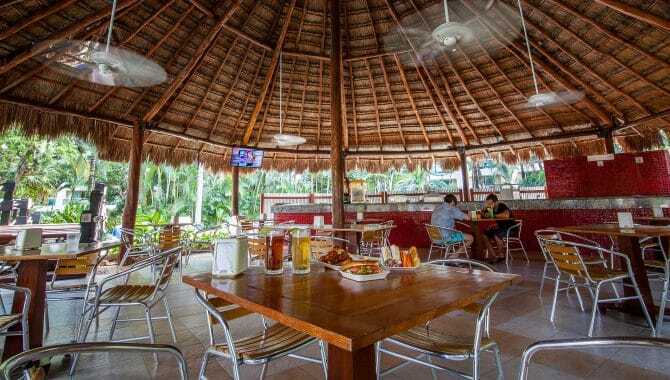 For burgers and pizza, try Palma Azul. 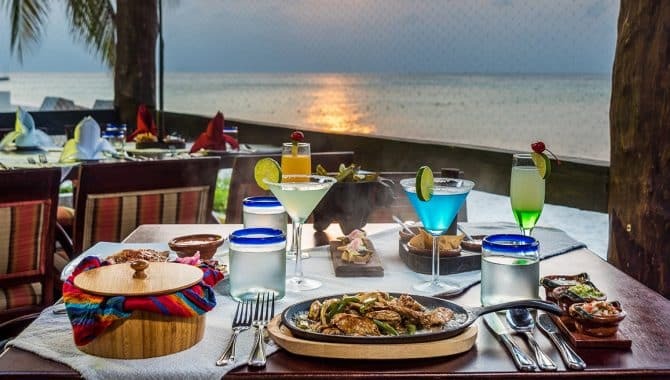 If you’re more in the mood for authentic local cuisine, Chan Ka’an is the place to go. 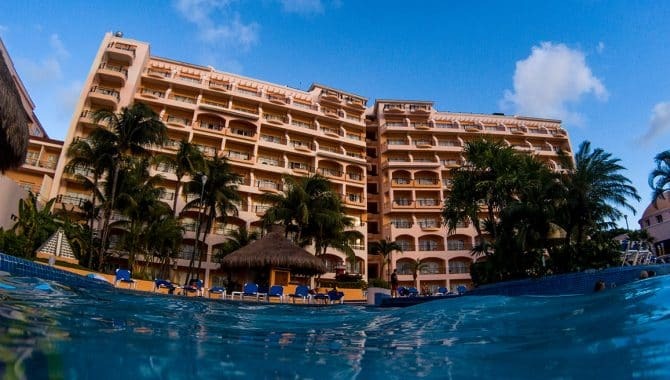 Finish off the night with drinks at the Palma Azul Sports Bar or unwind with a dip in the oceanfront pool. 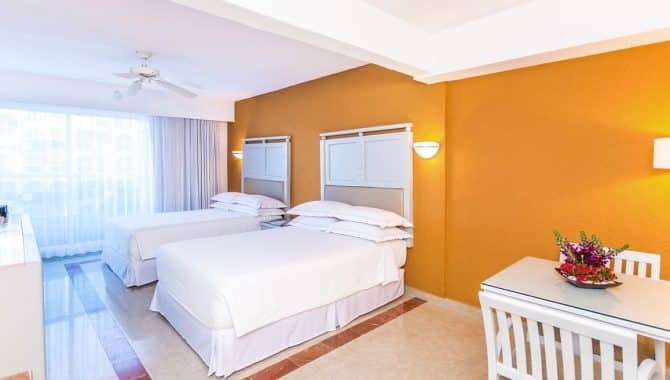 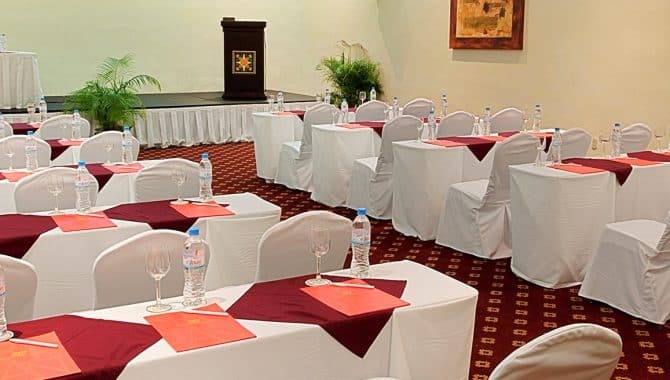 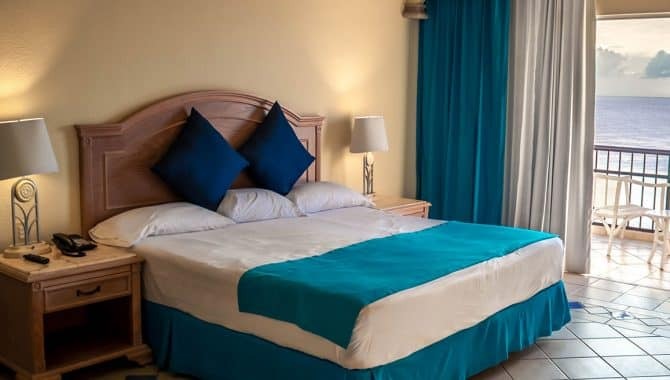 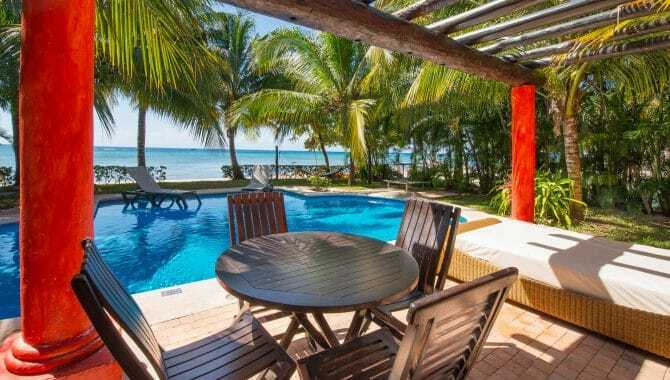 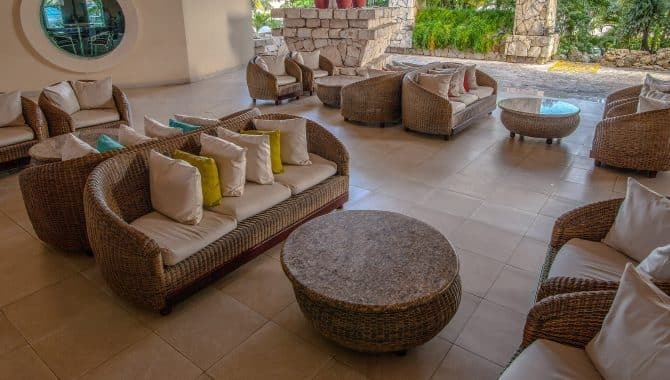 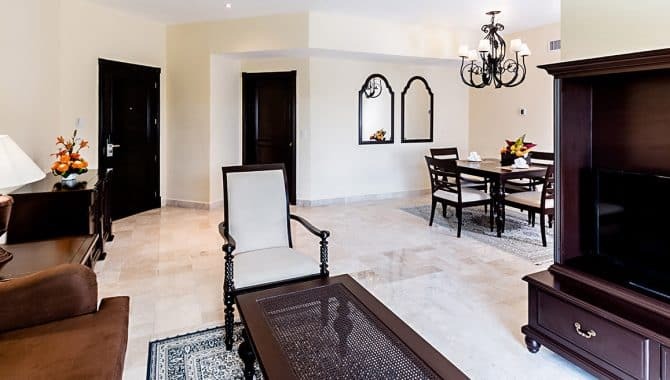 This Cozumel hotel also strives to personalize their guests’ experience through their many rooms, suite, and plan options. 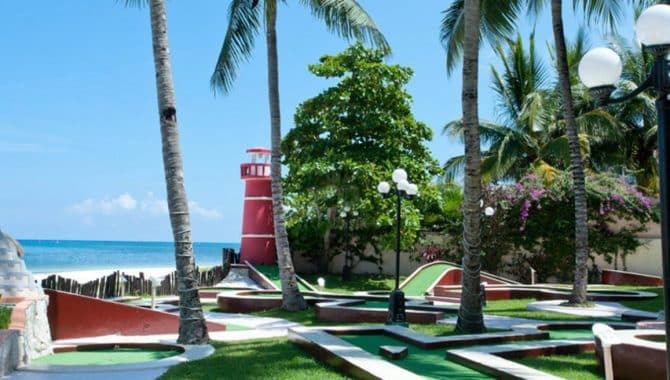 The golf and breakfast package offers complimentary breakfast, free WiFi and unlimited games of golf at the Cozumel Country Club. 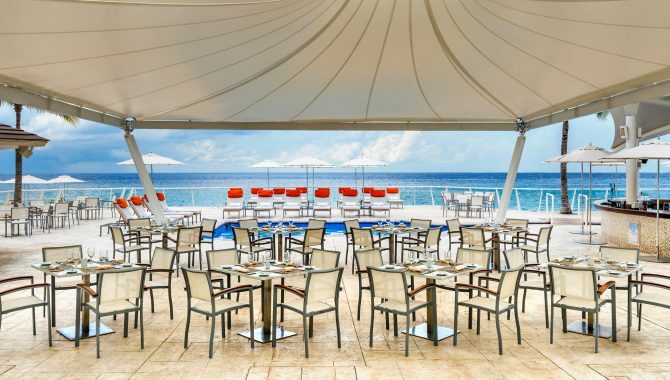 For a more encompassing experience, the resort’s all-inclusive plan offers an extensive selection of food and drink choices. 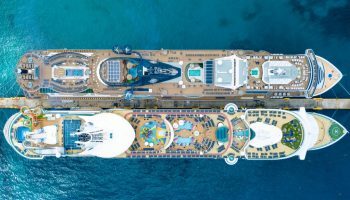 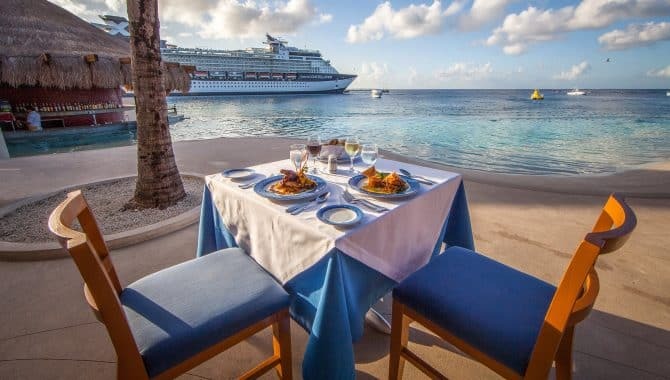 There’s also an option for cruise ship travelers on day excursions—enjoy drinks and food with an oceanfront view at the resort’s beach club. 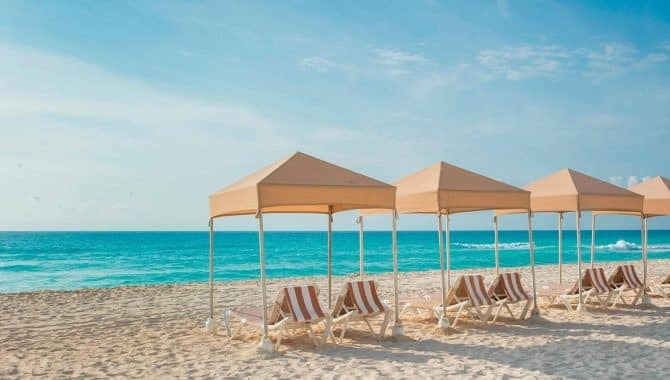 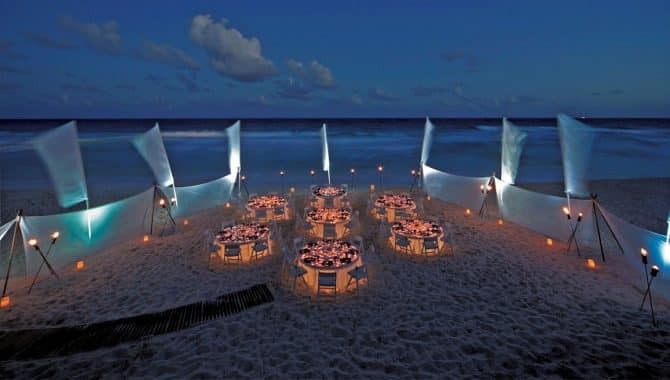 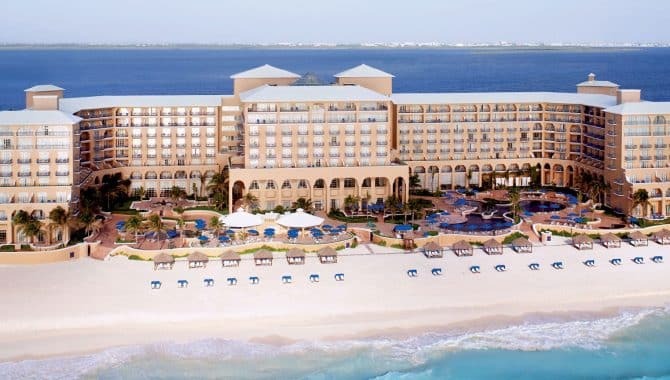 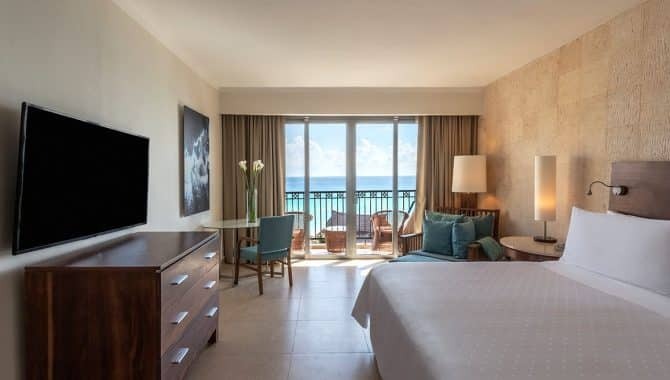 This Ritz Carlton resort is situated on a lovely stretch of beach in one of the hottest spots in Cancún, the bustling Hotel Zone. 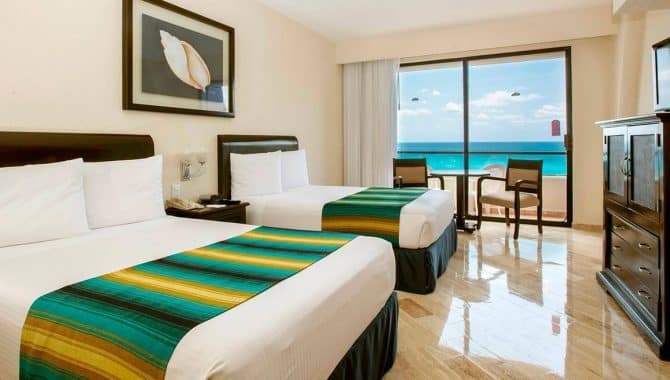 This prime location makes the resort ideal for activity-minded families, as well as anyone looking to sample Cancún’s abundant nightlife options. 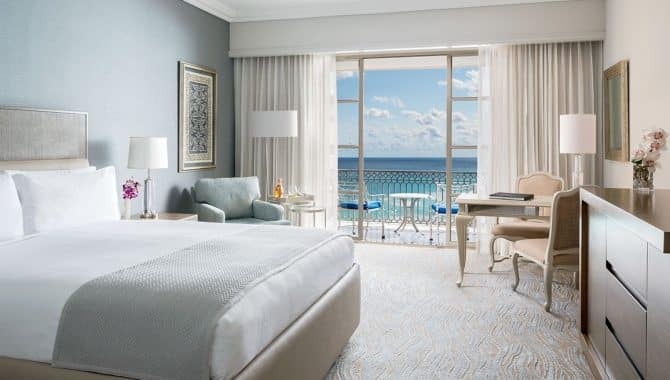 Guests will find that the Ritz is adept at accommodating anyone, offering a kids program, world-class spa services and a variety of dining options and experiences to please everyone. 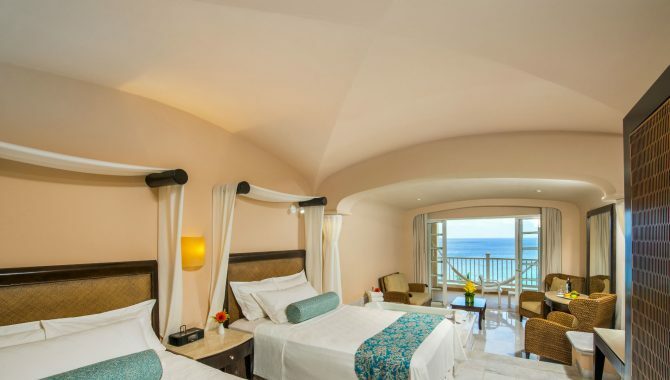 Rooms are peaceful and elegantly decorated, boasting private ocean-view balconies and large marble bathrooms with showers and deep soaking tubs. 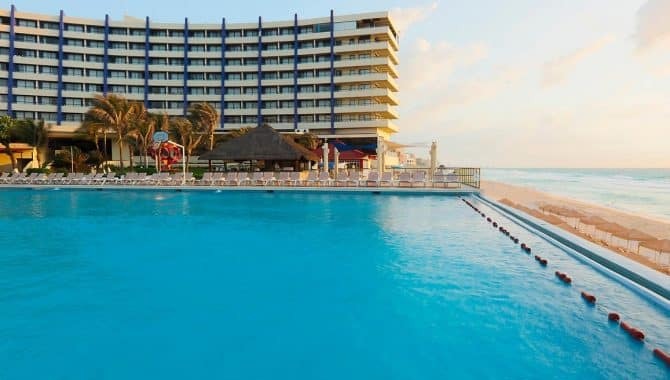 There are also two ocean view pools with lots of lounging options, for whenever you want some rest and relaxation in the Cancún sunshine. 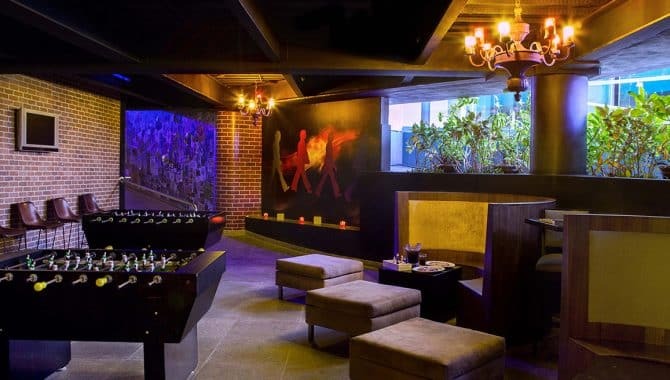 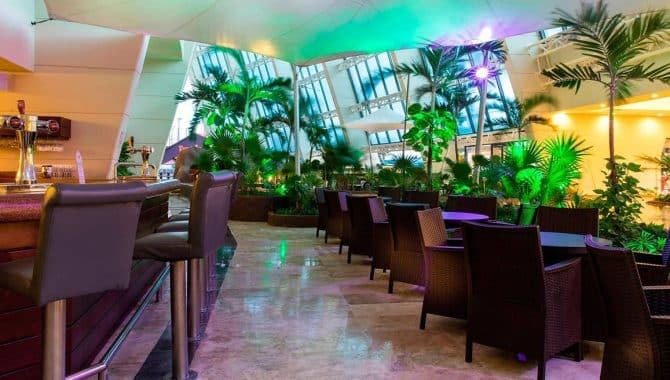 The lobby lounge, which offers expertly crafted cocktails and freshly prepared sushi in a luxe setting, is perfect for a late afternoon nosh, and there are many options for larger appetites as well. 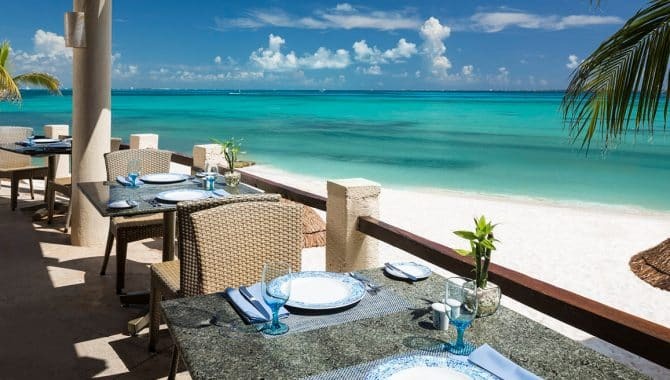 For a special meal, guests will especially love the upscale Mediterranean fare at Fantino, though the offerings at casual eateries El Cafe Mexicano and Caribe Bar & Grill—which is right by the pool—are plenty mouthwatering as well. 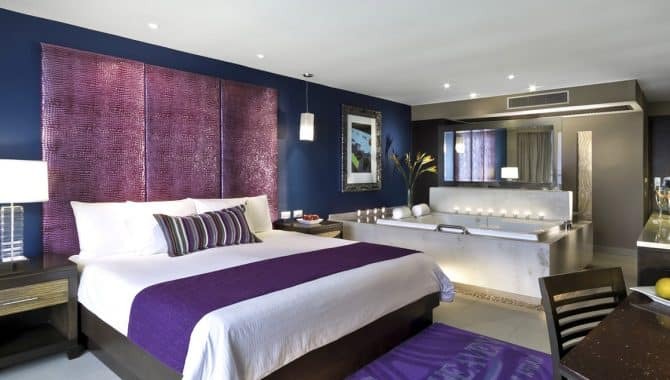 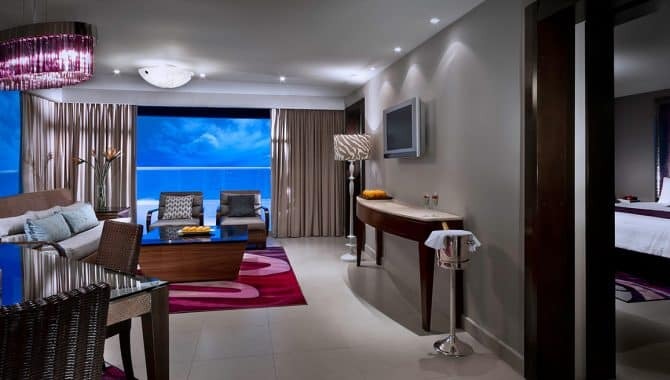 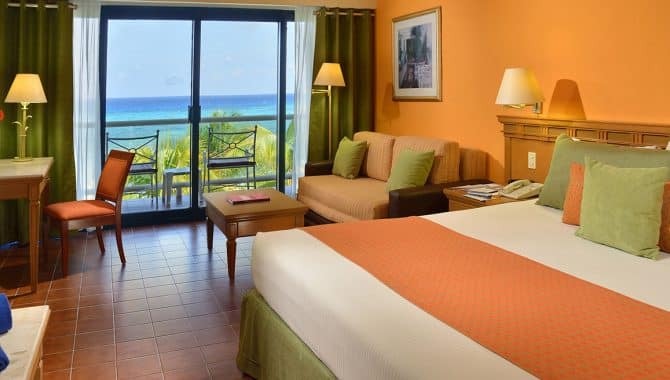 The Hard Rock Hotel Cancún is designed with the needs of the whole family in mind. 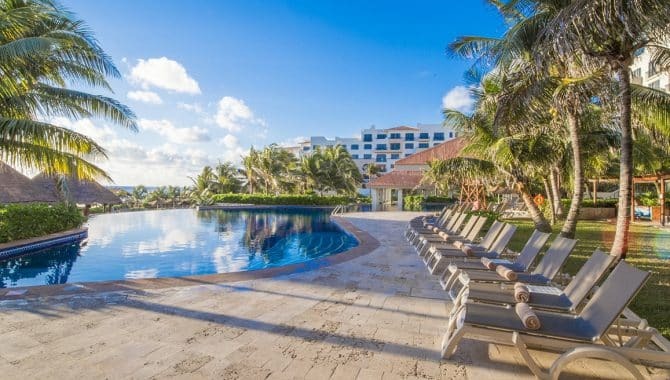 Hit the beach or pool and enjoy handcrafted drinks from the two pool-side bars or the Bunker Bar, which provides beach service daily. 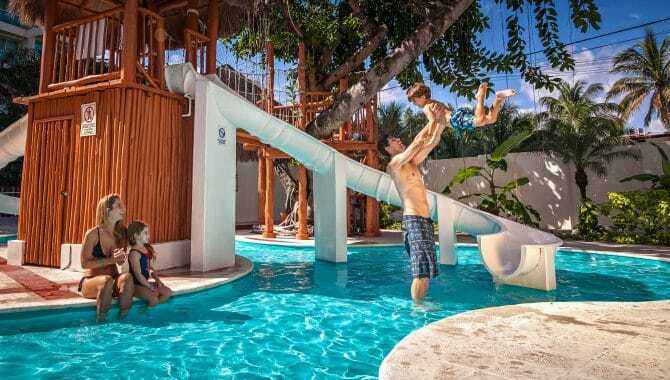 While parents enjoy a day of lounging, kids can go wild at the Kids’ Club with its fully stocked game room, trampoline and age-restricted pool. 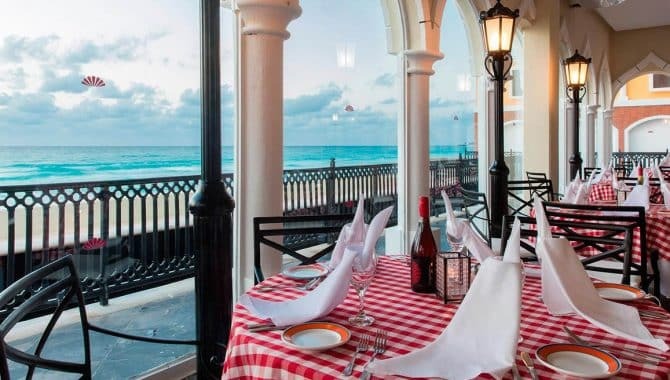 When it comes to dining, guests can start their days off with breakfast at Ciao, which transforms into an Italian restaurant for dinner. 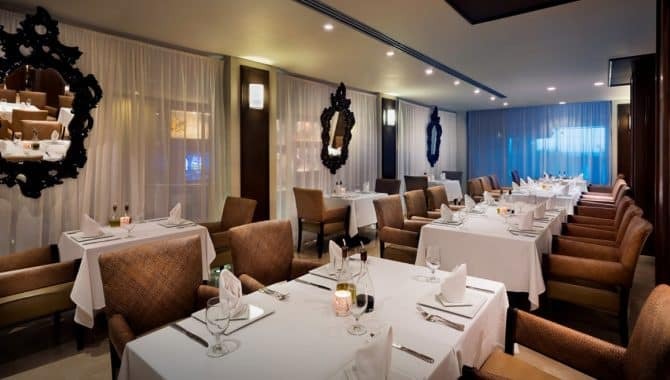 A fine dining experience is found with the Asian-cuisine dishes at Zen or the Brazilian steakhouse, Ipanema. 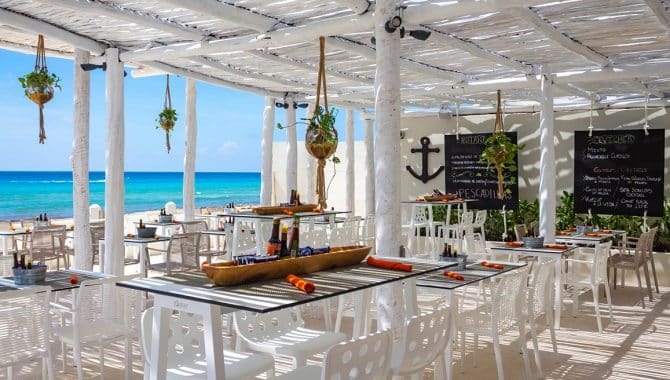 If you prefer a more casual atmosphere, hit up the buffet at The Market, enjoy traditional Mexico-inspired dishes at Frida or indulge on artisanal pizza at Pizzeto. 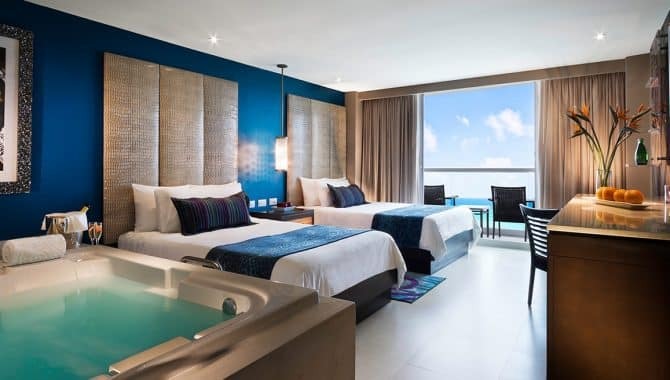 All resort accommodations at the Hard Rock Hotel Cancún feature a hydro spa tub, private balcony or terrace and 24-hour room service. 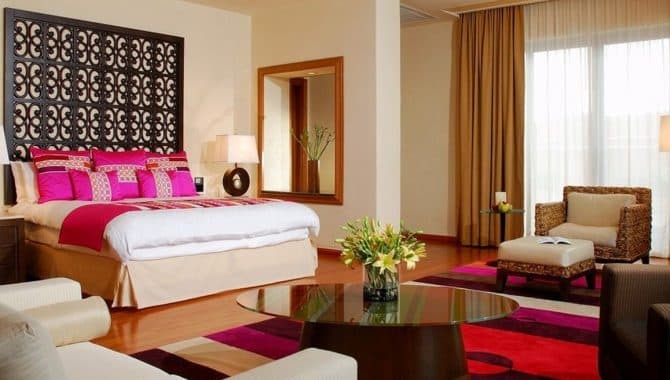 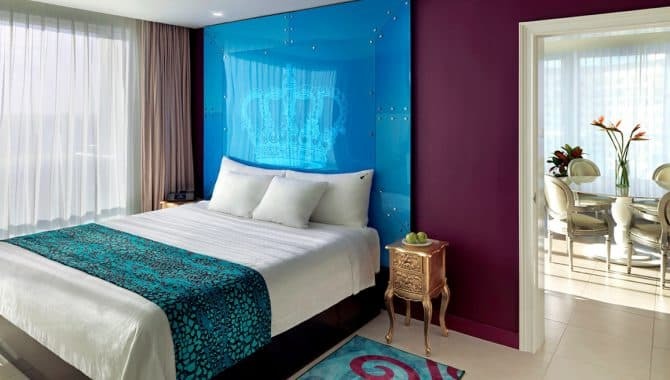 The deluxe rooms are available with a single king-size bed or two double beds. 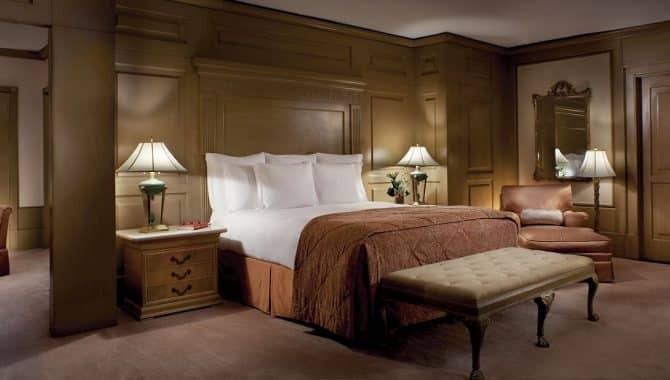 The Deluxe Gold-Pure option features hypoallergenic furnishings to accommodate allergy sufferers. 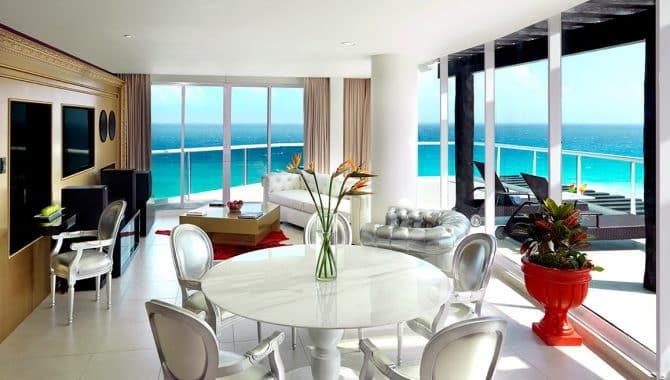 The Rock Suite offers one or two-bedroom arrangements with separate living areas. 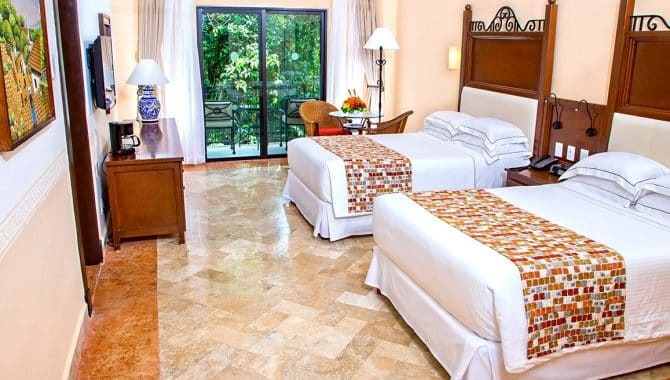 All Rock Royalty Level rooms and suites offer the added bonus of a personal assistant. 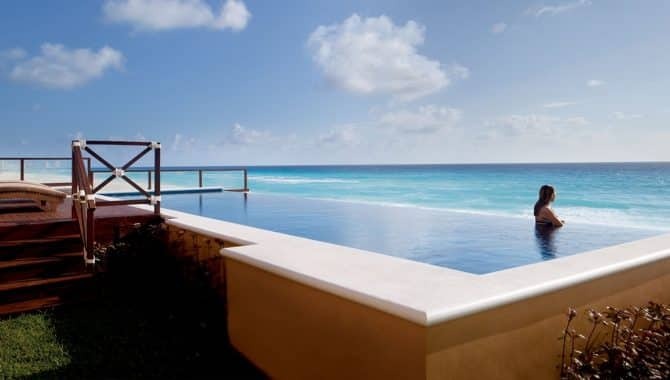 Few views can feel more relaxing than a tropical pool complex transitioning seamlessly into a placid beachfront. 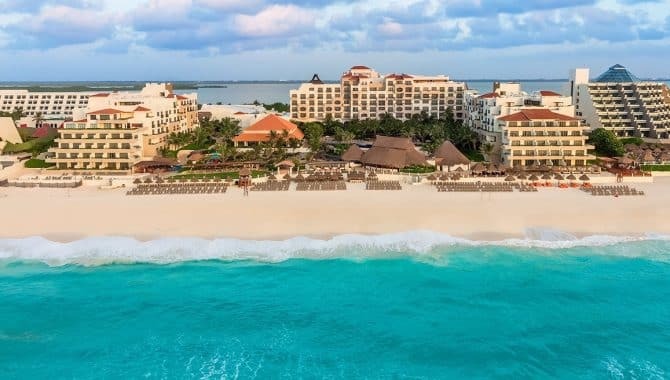 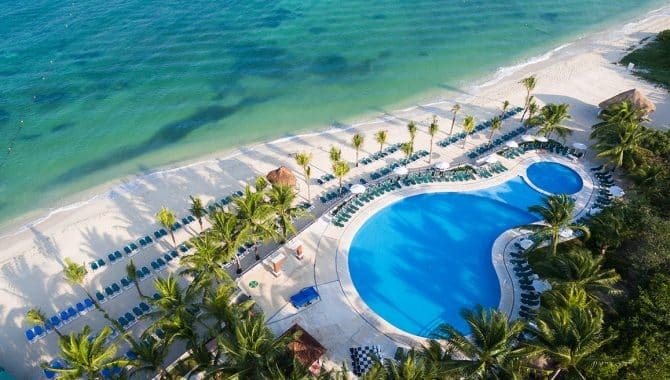 Grand Fiesta Americana Coral Beach Cancún’s shore-hugging layout makes it easy to go from sand to deck and back again. 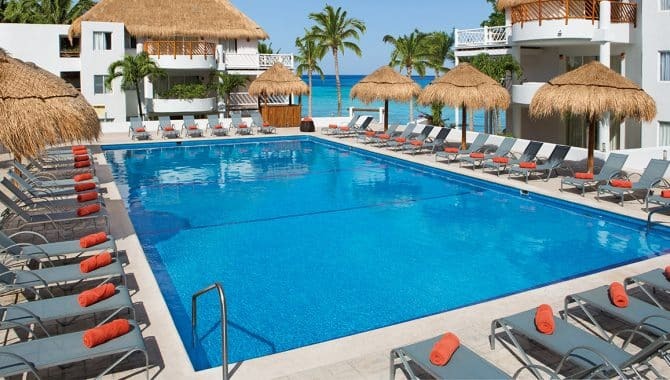 There’s also a swim-up bar in the pool. 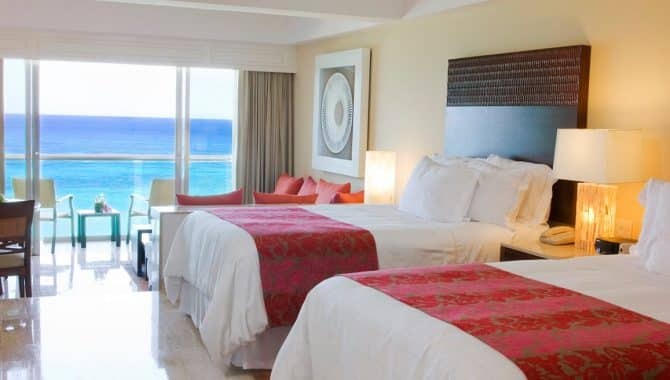 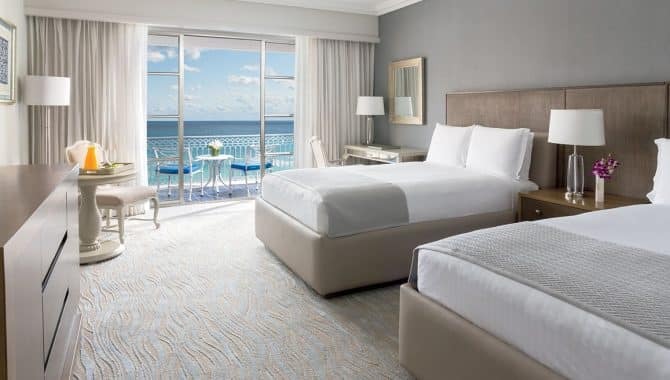 All 602 rooms are updated, offer free WiFi and large screen TVs, and have breathtaking views of the ocean. 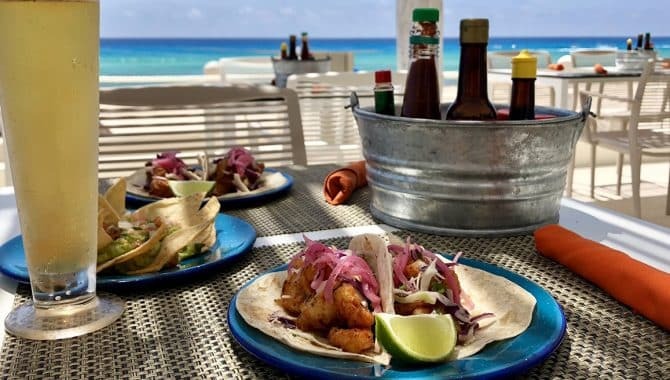 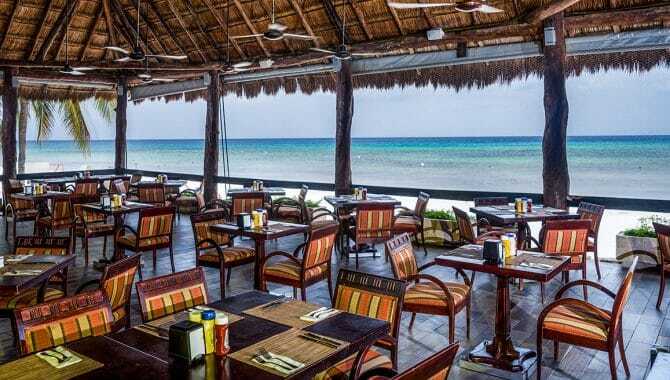 The three restaurants on property offer a delicious variety of cuisines—French, Mexican and seafood—while the lobby bar is the perfect place to enjoy a margarita. 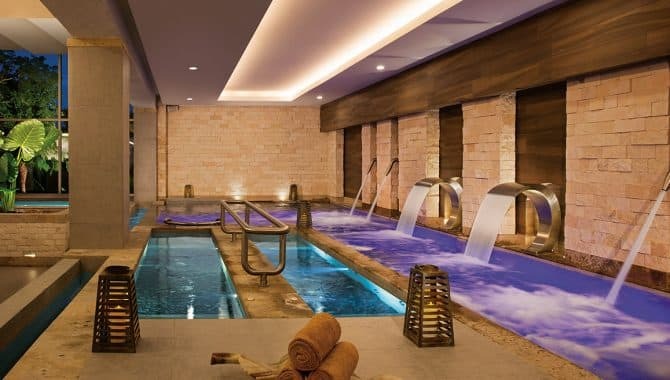 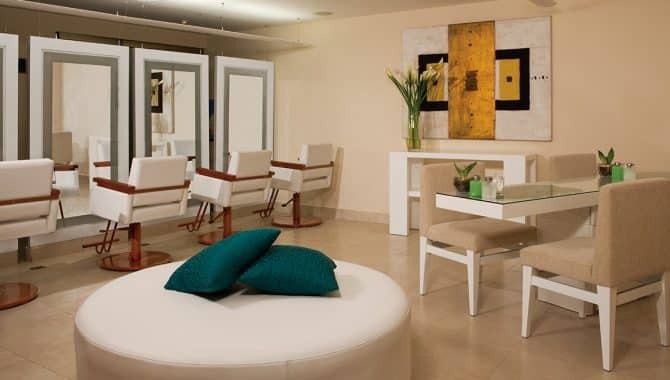 The unique spa is beautifully designed and boasts the only “10-step hydrotherapy” program in the area. 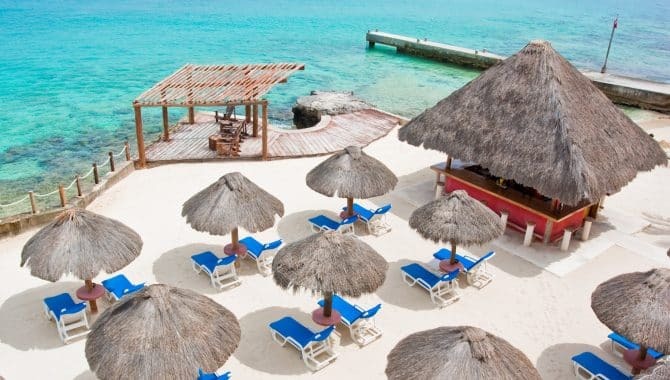 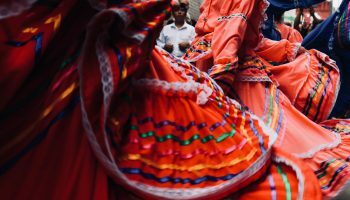 Just steps away from the hotel is a ferry will take you to the Isla de Mujeres in a short half-hour trip—a true cultural gem just off the coast. 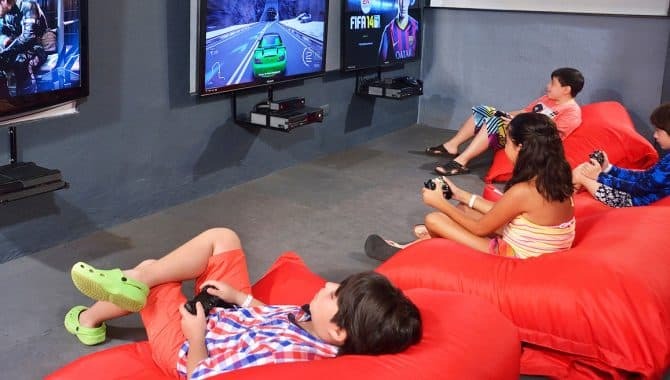 There’s also a kids’ club with supervised activities for parents looking to keep the young ones happy. 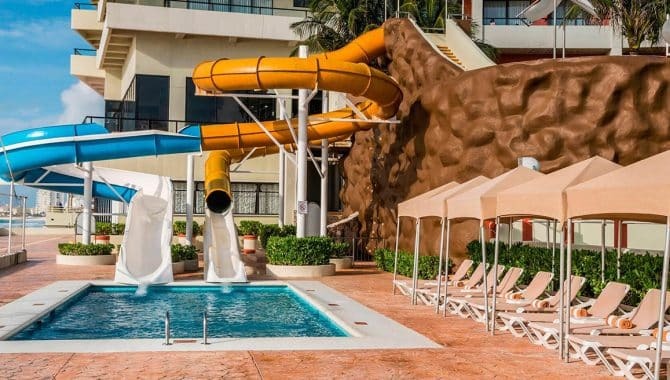 A fixture in Cancún’s Hotel Zone since the ’90s, Crown Paradise Club has everything on-site that a couple or family needs for a fun and memorable beach vacation. 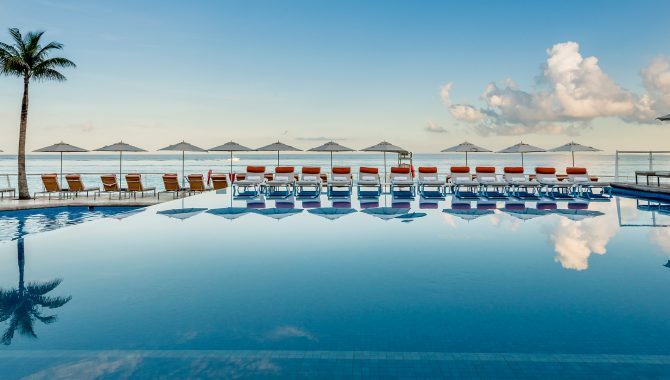 Multiple pools (including family, kids and adults-only), spa, gym, cinema, shops, a theater with nightly shows and a great stretch of beach will keep you busy from sun-up until well after dark. 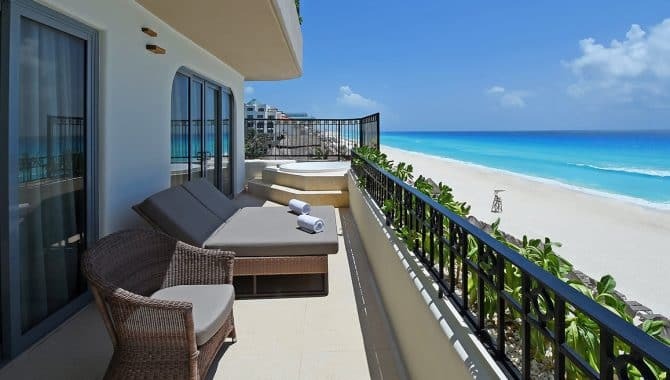 Every one of the resort’s 617 rooms comes with a balcony and spectacular ocean view. 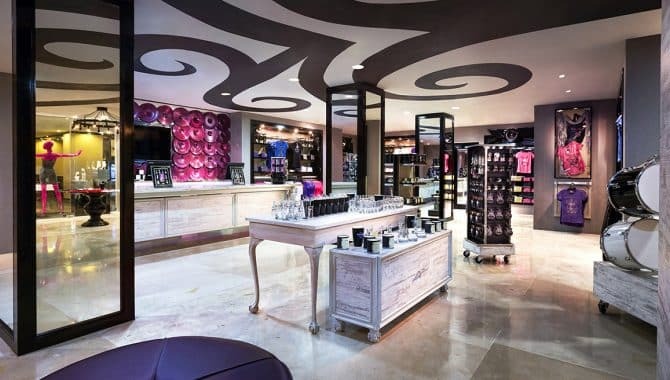 Free WiFi and a daily-replenished minibar are among the amenities all guests will enjoy. 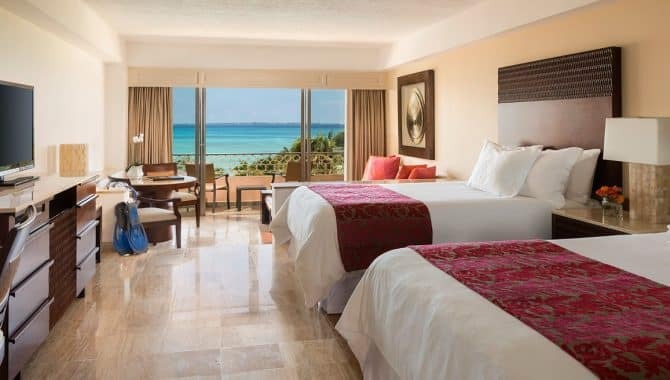 The rooms are available in six categories: standard, standard plus, family, special suite, honeymoon suite and Club Crown suite. 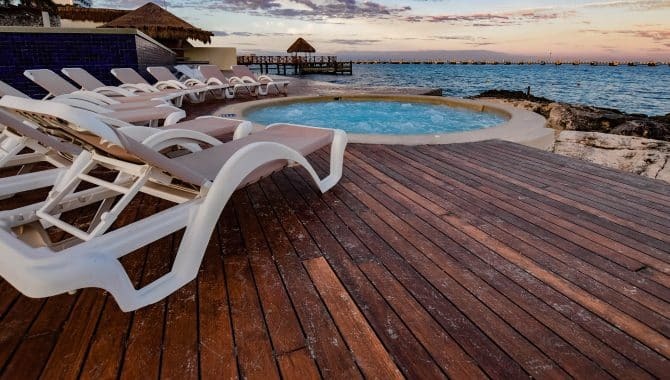 The latter two come with double whirlpools, fruit baskets, sparkling wine and a lagoon cruise. 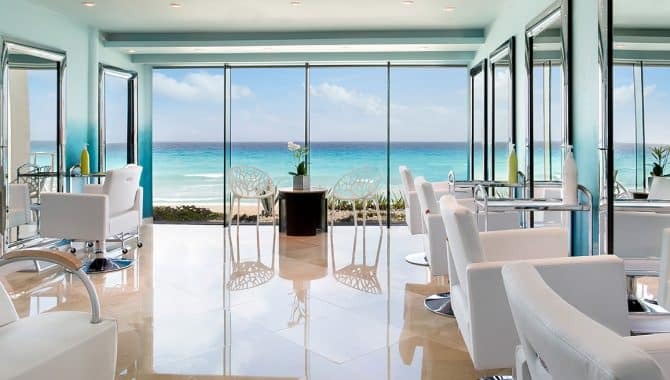 There are plenty of dining choices at Crown Paradise Club. 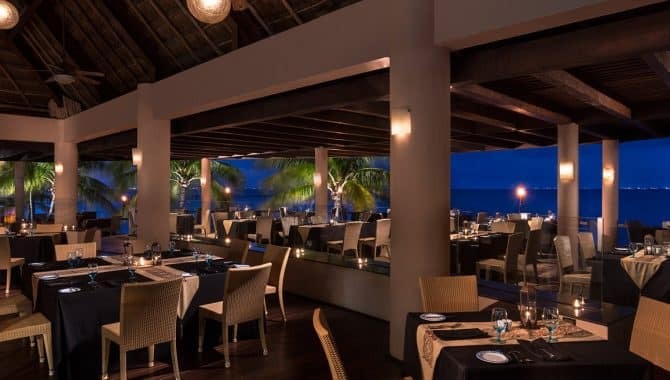 Guests can enjoy a dinner of Italian, French, Mexican, seafood or fine grilled dishes at one of five á la carte specialty restaurants. 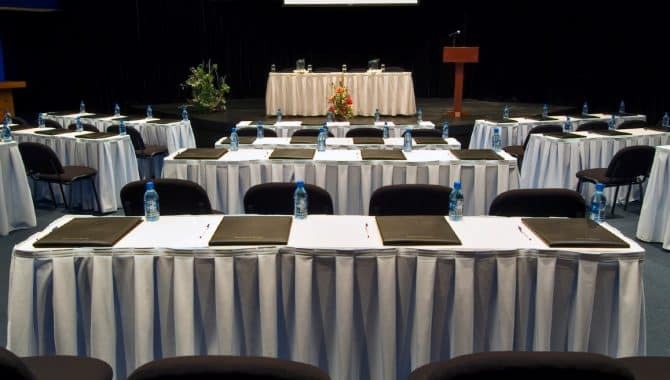 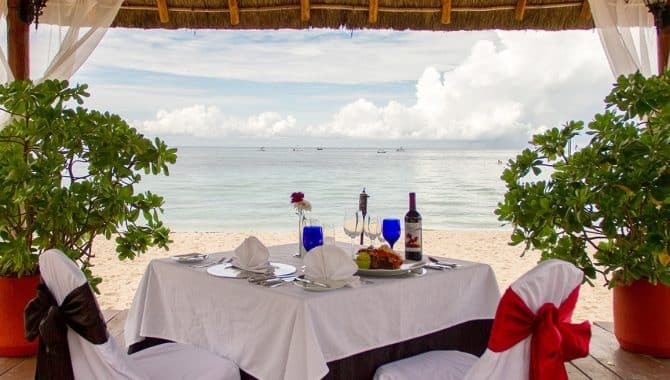 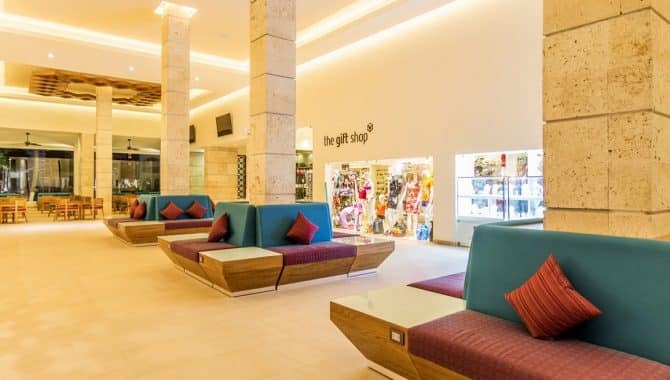 Two buffet restaurants—featuring international and Oriental cuisine—two snack bars and six bars serving domestic and imported drinks are also on-site. 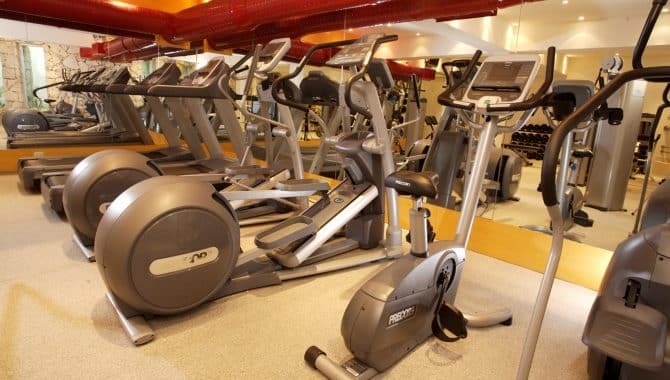 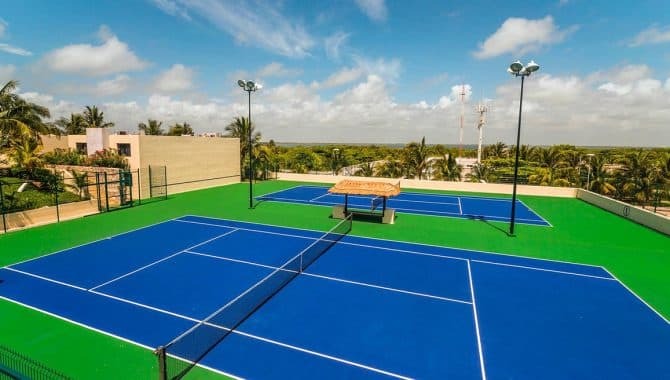 Additional amenities include tennis courts, mini golf, non-motorized water sports, a disco and activities like yoga, water aerobics and various games. 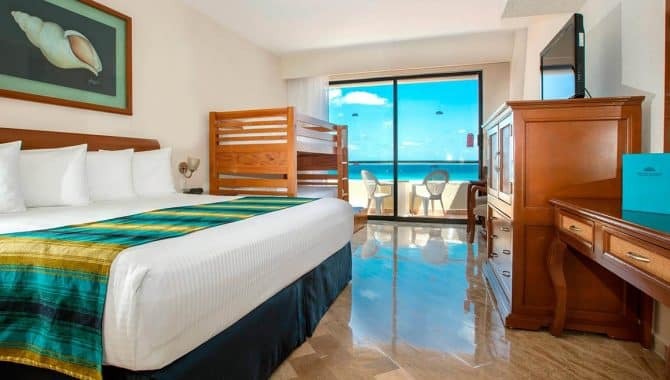 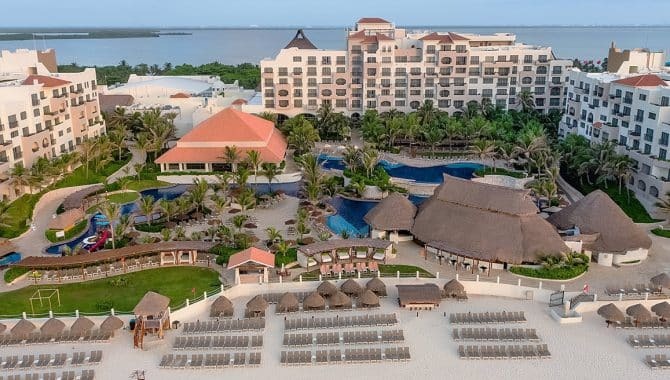 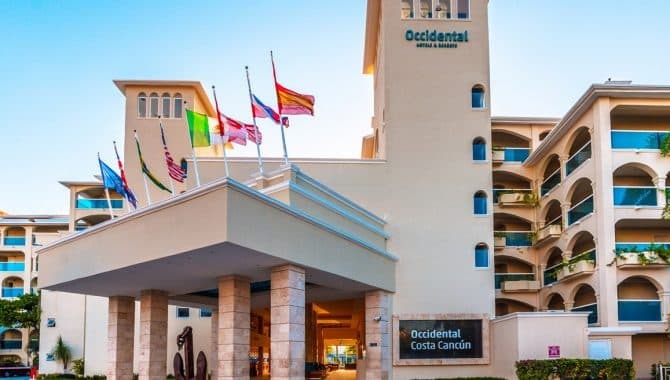 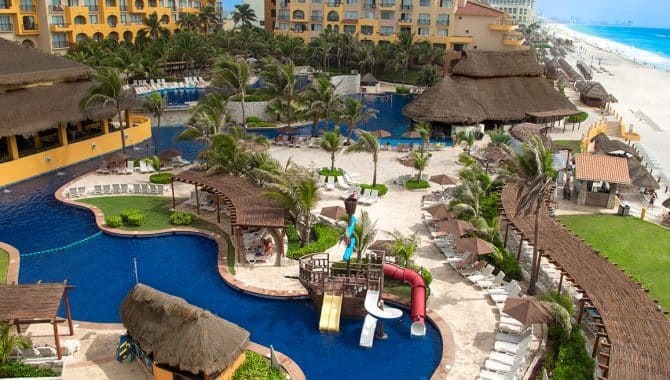 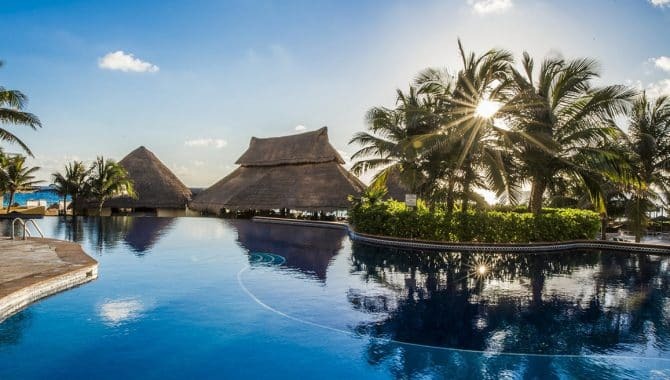 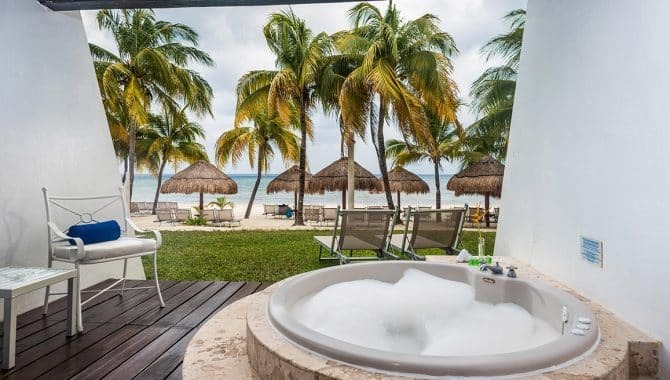 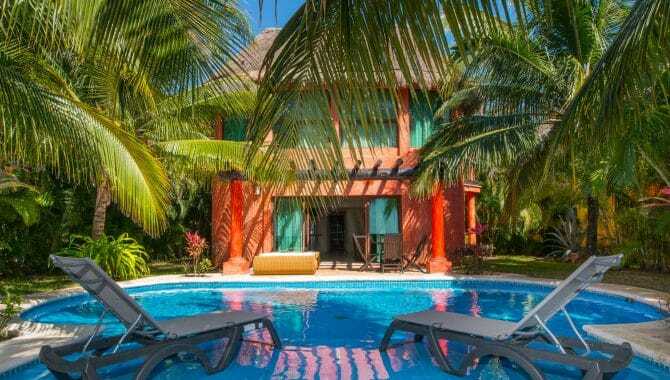 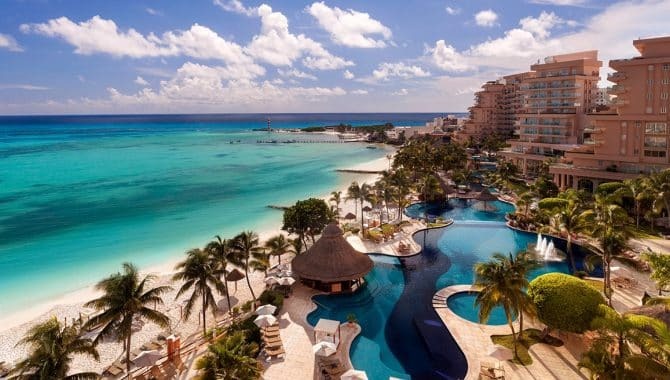 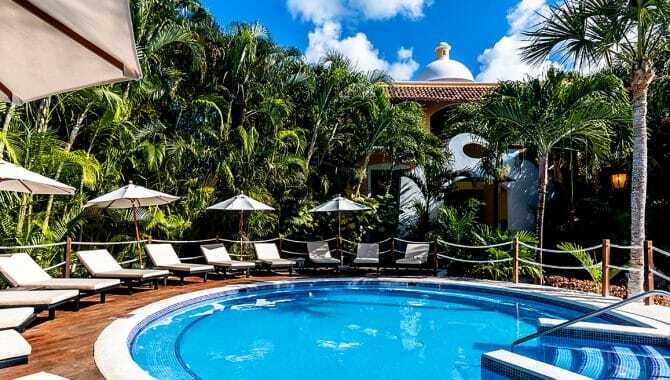 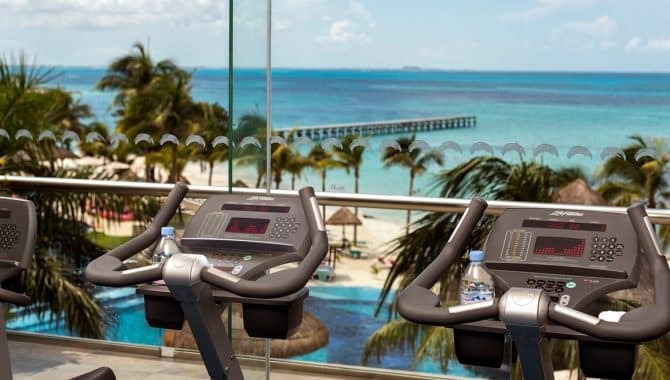 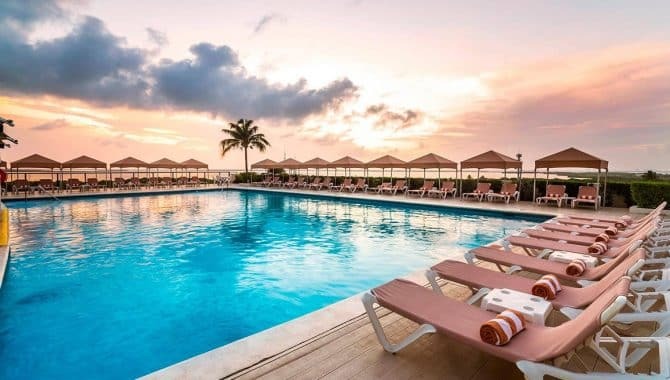 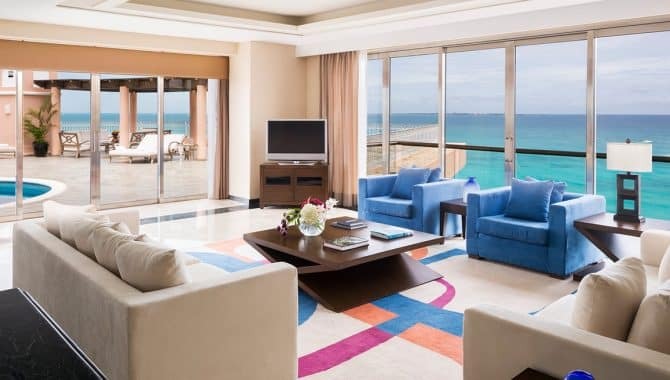 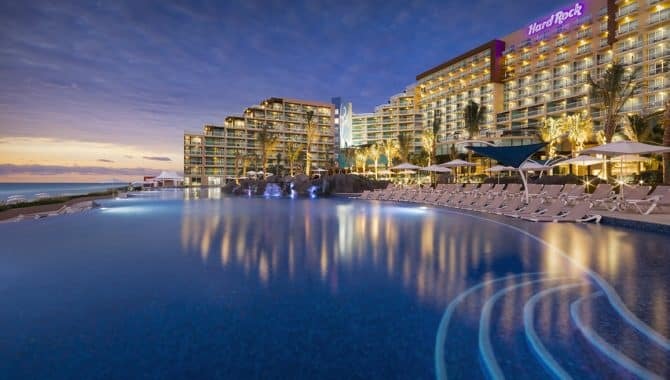 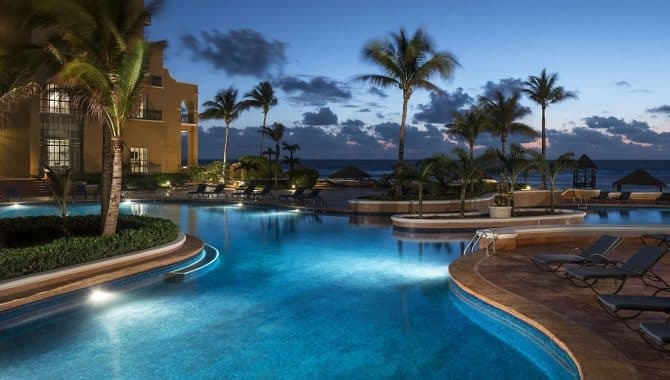 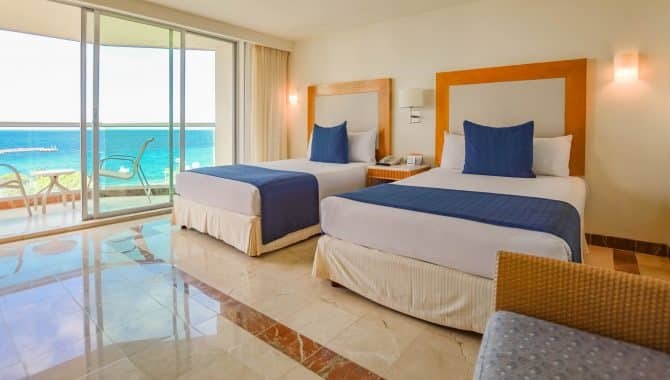 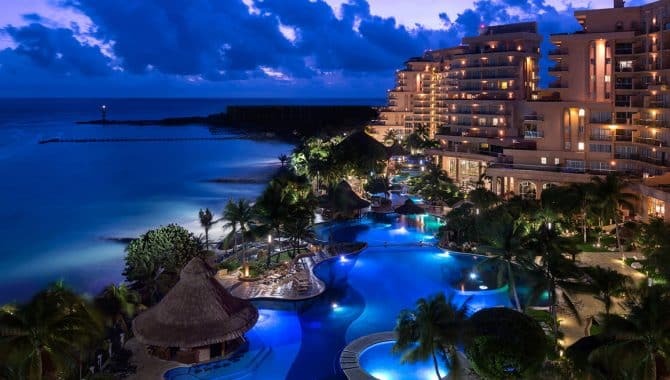 Geared for a family vibe, Occidental Costa Cancún offers the requisite pool complex and beach access but also houses game rooms and 24-hour snack bars. 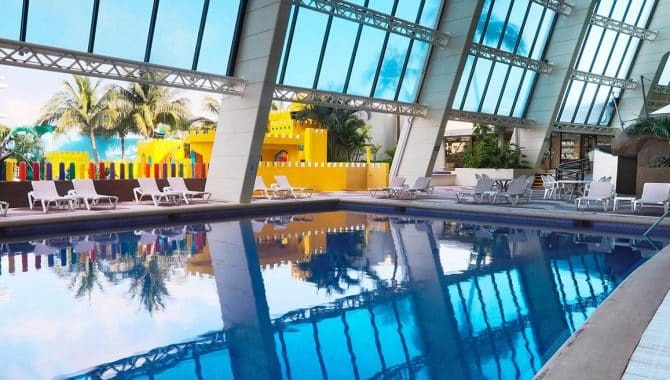 The huge pool features water jets, spots for loungers inside of the pool and a giant chess board nearby. 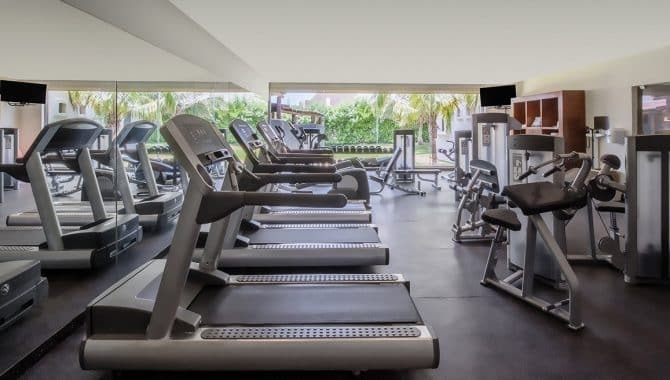 A stylish spa with a full complement of amenities is part of the deal, as is an expansive fitness club with state-of-the-art equipment. 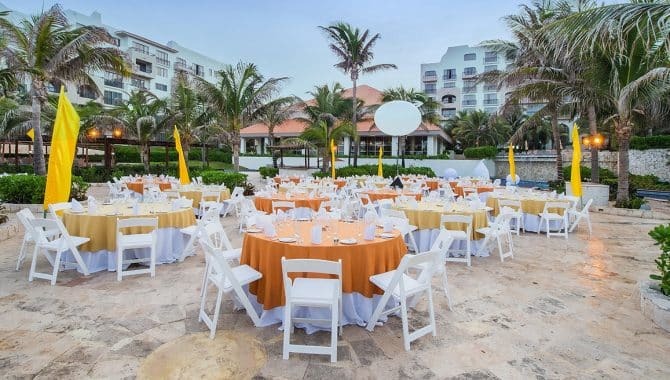 The property hosts four restaurants—Mexican, seafood, Italian, and international—with a mix of dinner and buffet menus. 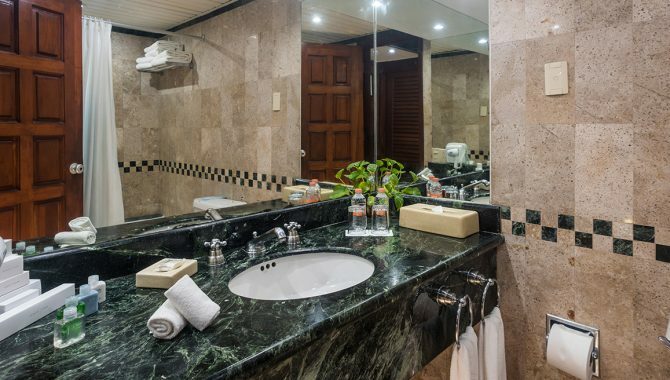 This resort has 358 beautiful and comfortable rooms, equipped with a minibar, LCD TV and electronic safe, all with 24-hour room service. 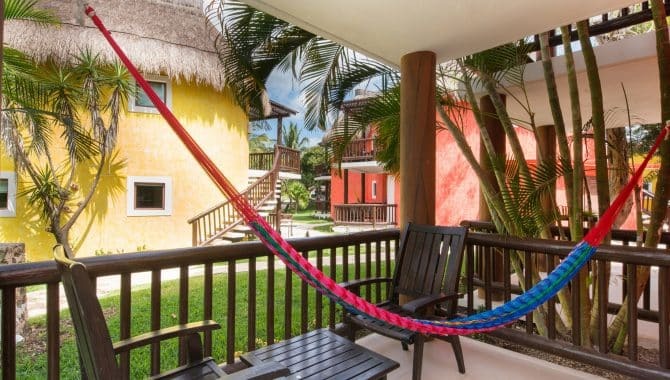 The Junior Suite has a large private terrace and its own hot tub and hammock. 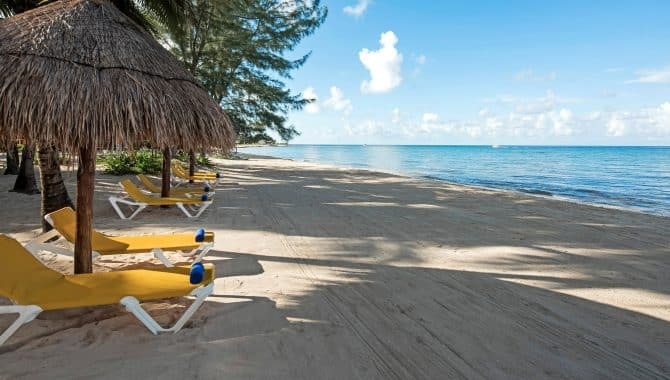 Exploring the shore brings guests to the doorsteps of some of the most popular beaches in the area. 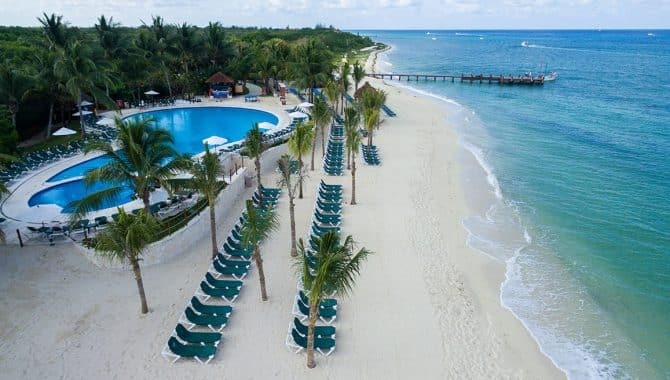 As for the resort’s own beach, the water is shallow, clear and tranquil, inviting bathers to unwind in the warm embrace of Caribbean turquoise. 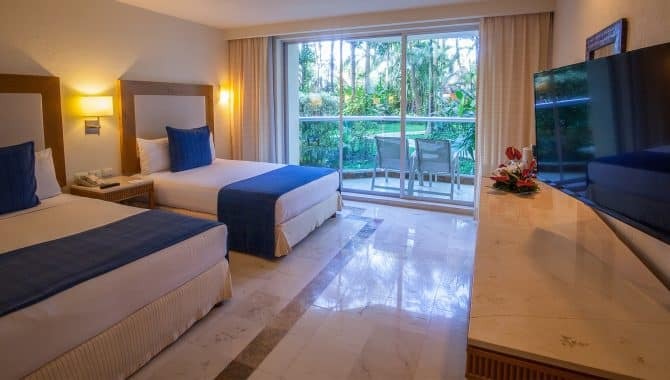 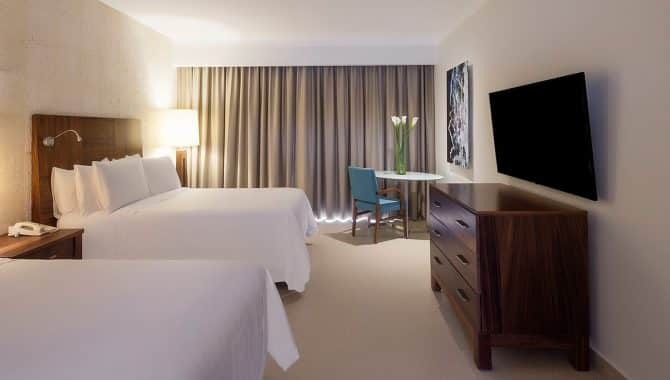 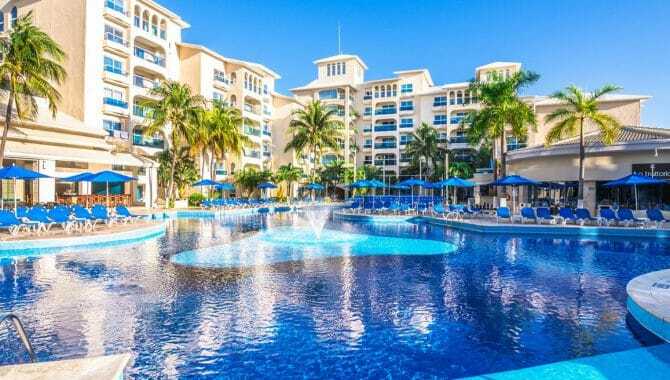 Set in a prime location in the heart of Cancúns ever-popular Hotel Zone, the Fiesta Americana Condesa resort is an excellent choice for families, honeymooners and party-goers alike. 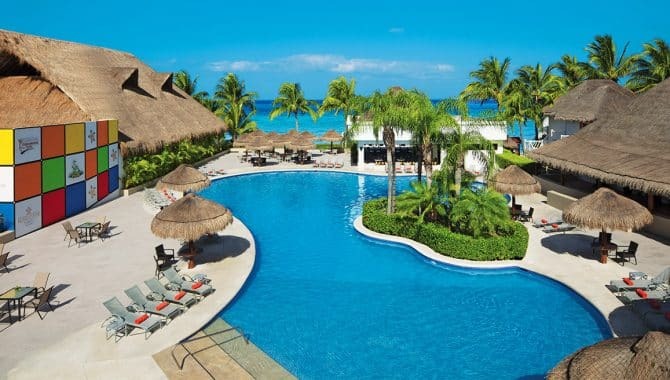 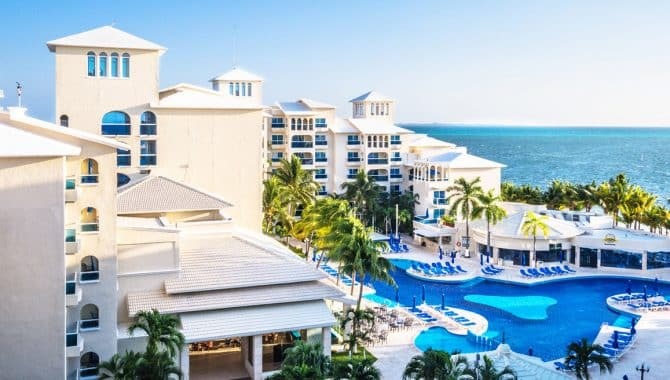 This all-inclusive property boasts a number of amenities, including access to a whopping 11 different dining options, a full-service spa and an enormous bi-level swimming pool with a kids swimming area and swim-up bar (not to mention a poolside smoothie station to keep you cool). 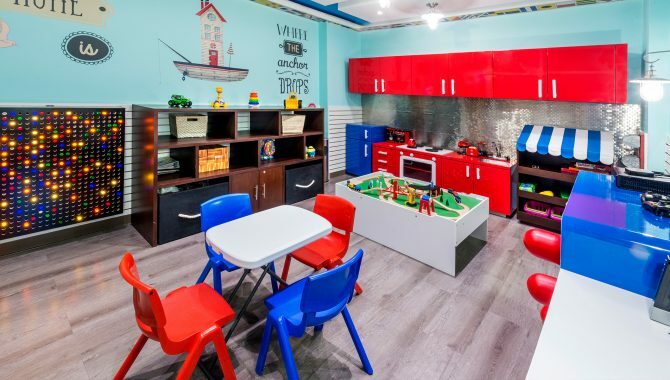 And speaking of kids, there’s also a kids’ club and game room to keep younger guests occupied during their stay. 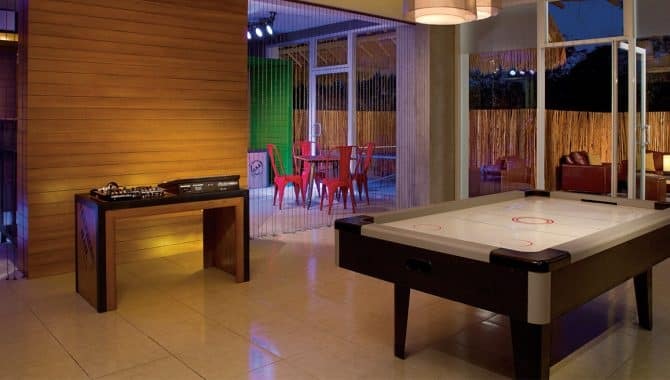 Rooms, which have recently undergone a renovation, sport a sharp, modern look. 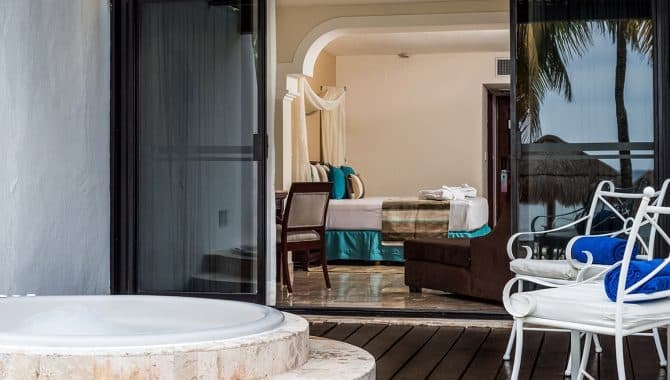 Each comes equipped with a rainfall shower, upscale toiletries, comfortable beds and lovely views of the ocean or the property. 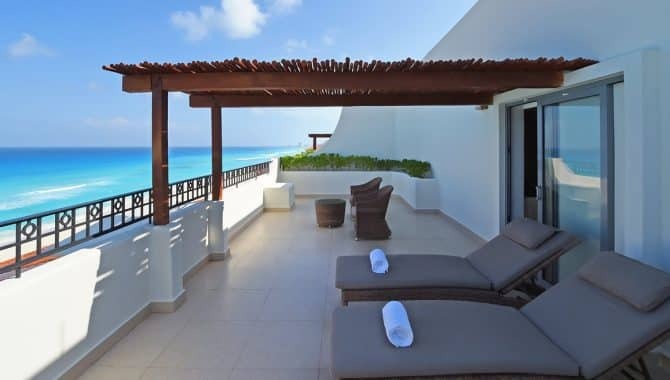 That said, not every room sports a balcony, so inquire about available options when booking your room. 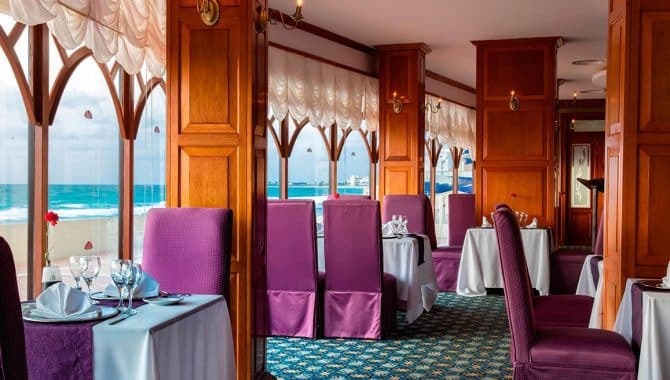 As for those 11 dining options, guests can choose between several cuisines from around the globe, with Asian, Mexican and Italian options on premises. 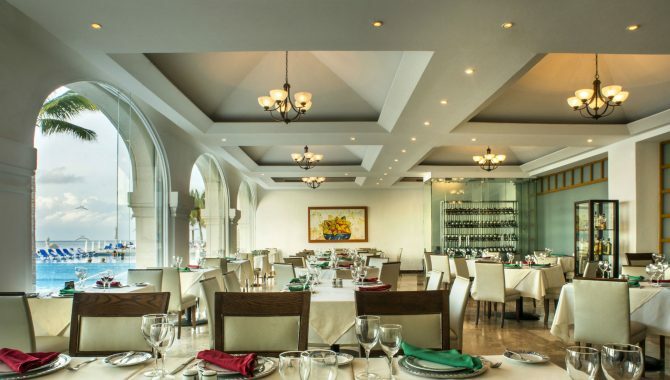 There’s also an all-day international buffet, Kalmia and San Telmo, an upscale steakhouse perfect for that romantic night out.